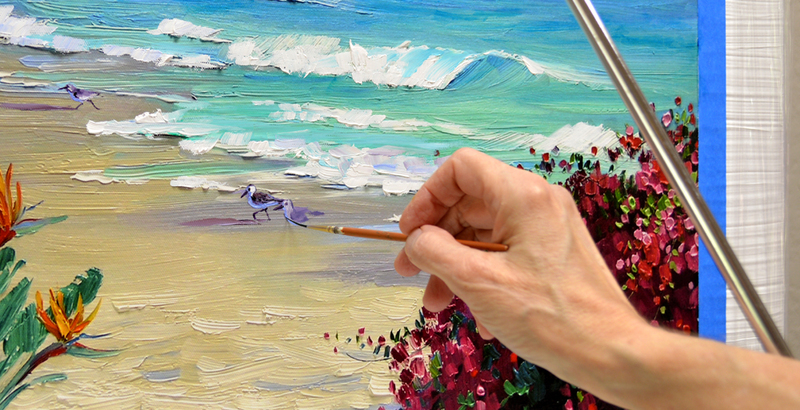 Today I’m working on a Limited Original, a digital reproduction of one of my original oil paintings that has been printed on canvas. 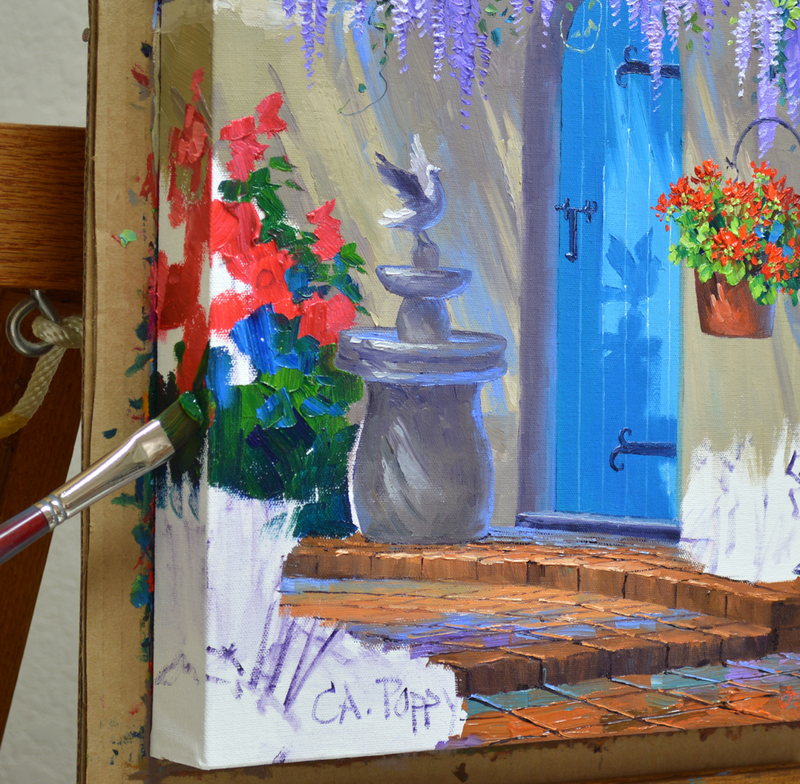 I enhance each piece with Alkyd Oil paint. It has the same intensity and longevity of regular oils but dries much faster. Every piece is part of an edition but is different because I never embellish them in the same way. Hence the name Limited Original. 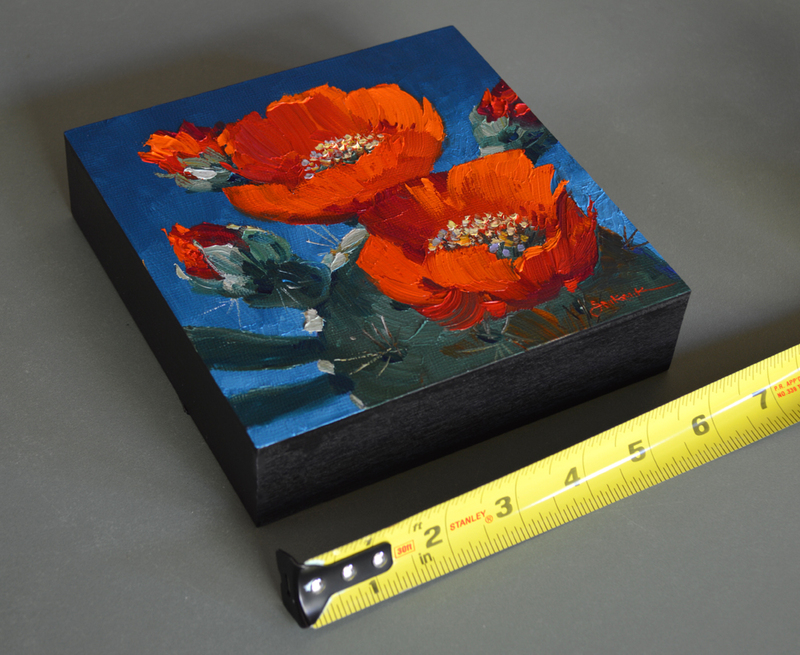 The giclee on canvas without any enhancement is shown above. A few days before painting on the giclee the entire image was covered with two thin coats of UV varnish to give added protection from sunlight. 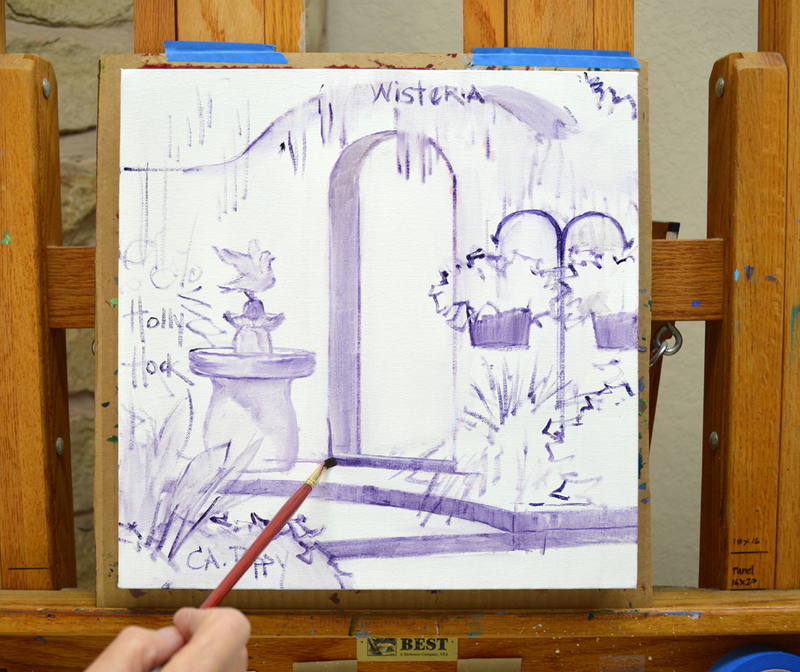 The first step when I begin embellishing the piece is to increase the vibrance of certain areas with oil washes. 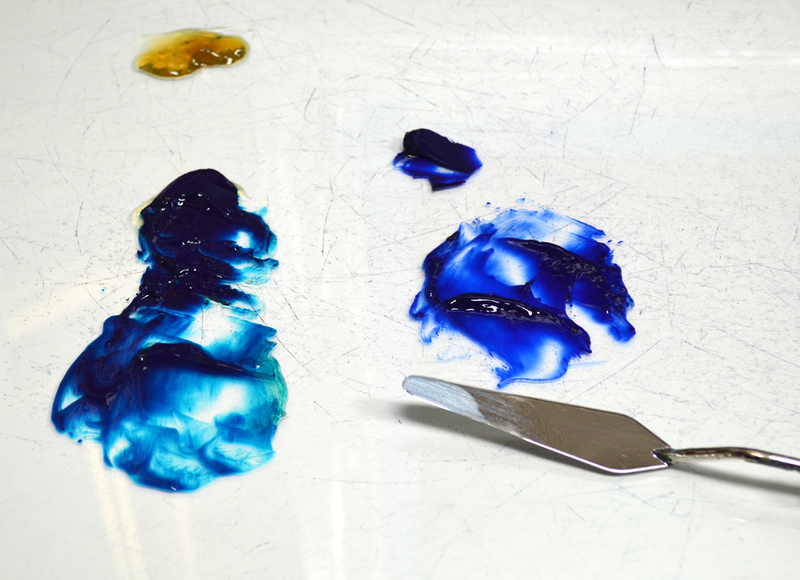 Pthalo Blue + Liquin is on the left, Ultramarine Blue + Liquin on the right. The liquin is the brownish blob in the upper left. The blue of the sky is washed with the Pthalo Blue mix. The area to the right of my brush has been covered. Can you see the difference from the portions of the sky to the left? 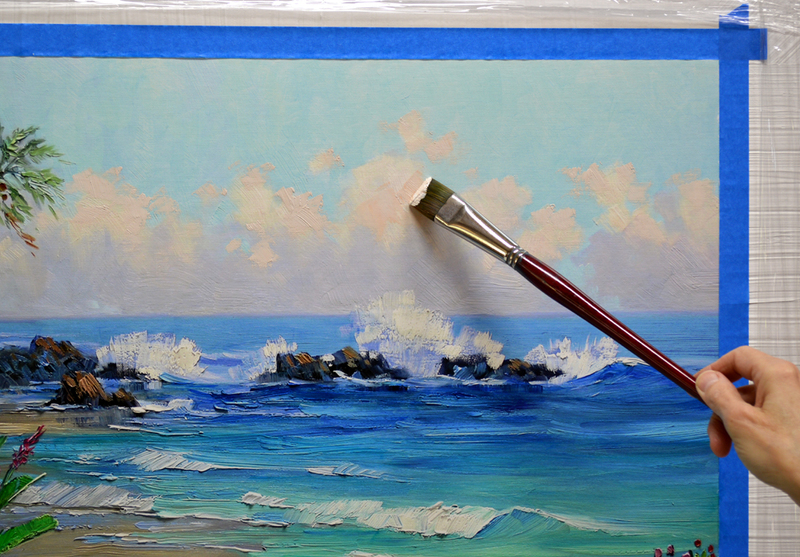 The ocean from the horizon to just in front of the rocks has been washed with the Ultramarine Blue mix. 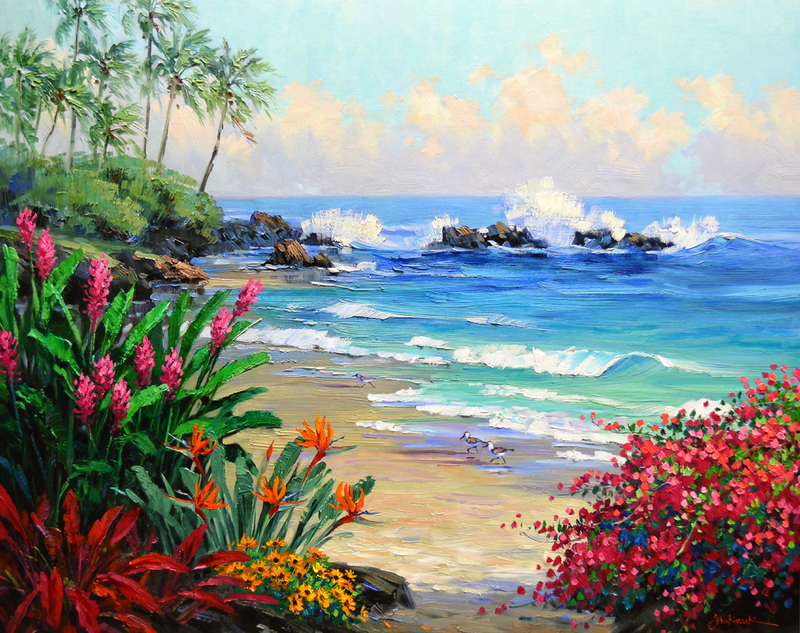 The Pthalo Blue mixture has been used on the water closer to the beach. 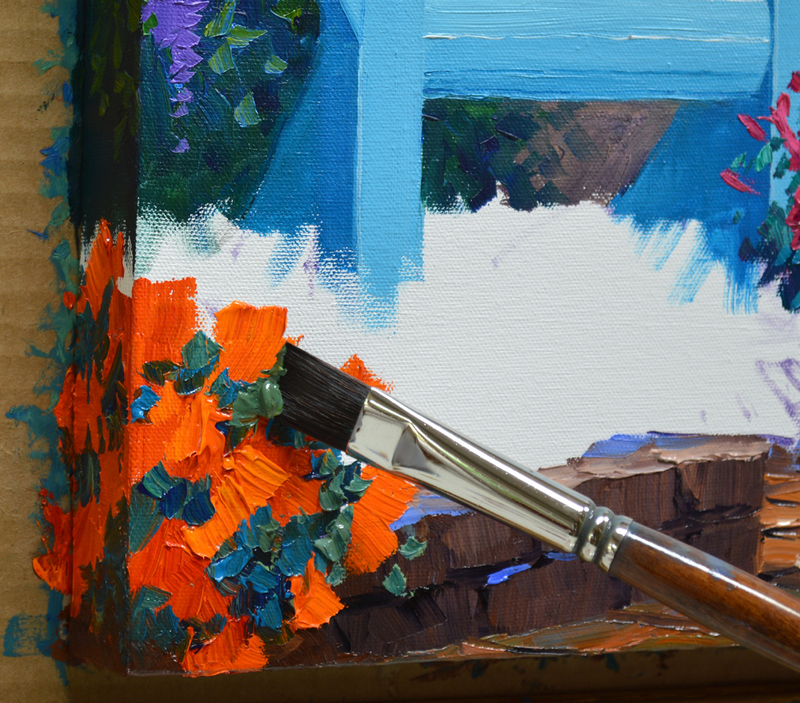 Then I go back to add warmth and texture to the clouds with opaque mixes of White + Cadmium Orange + Ultramarine Blue. 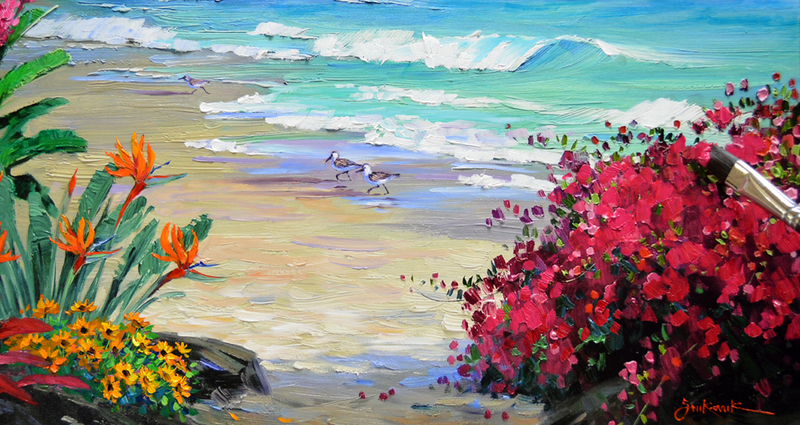 My collector grew up going to the beach and loves the sandpipers that run in the wet sand, just ahead of the encroaching sea foam. Bruce asked if I could add a few of them to his piece. NO PROBLEM. That’s the fun of doing the Limited Originals, we can add elements that make each piece unique. 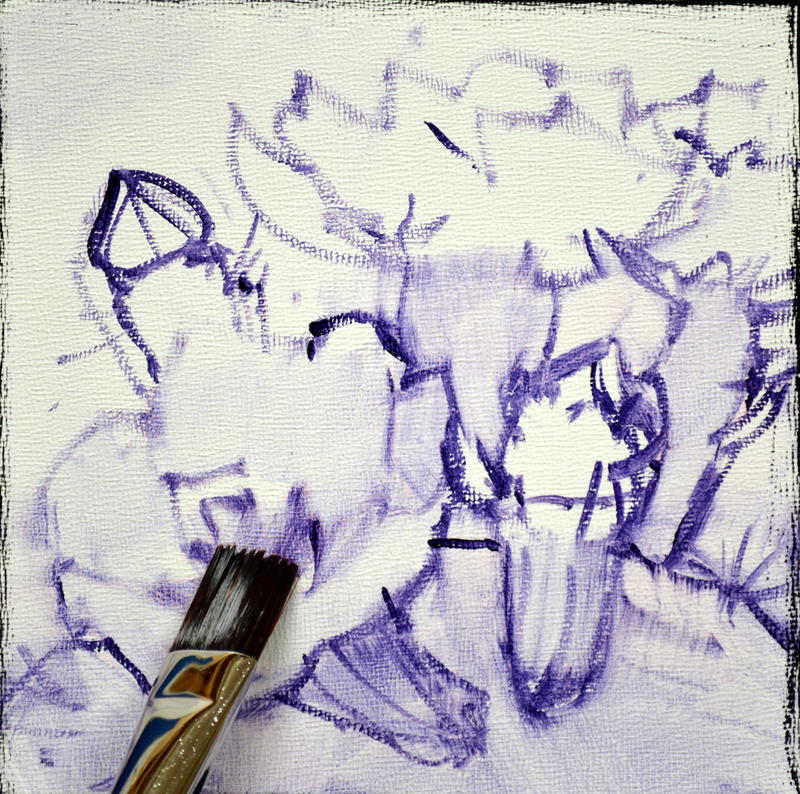 My arm is braced against the mahl stick to steady my hand as I delineate the nimble birds. Permanent Rose + White makes the bright Pink Ginger blossoms. The leaves have been washed with Viridian Green + Liquin. If you are new to my blog I just want to let you know you can click on any of the pictures to view them larger. Bruce also requested that I change the Magenta Impatiens to Yellow Daisies. The Bird of Paradise flowers and the Ti Plant in the left corner have been repainted. 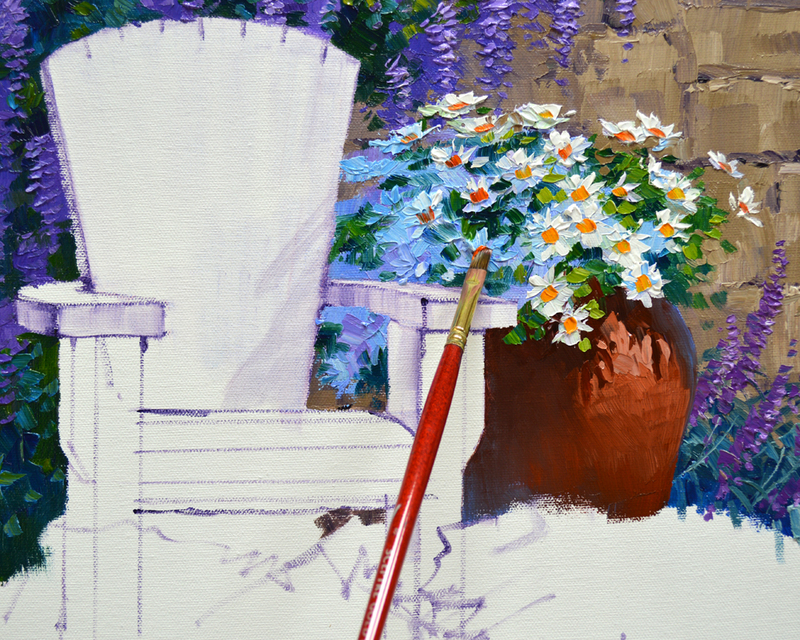 The Daisies are finished and I start working on the Bougainvillea. 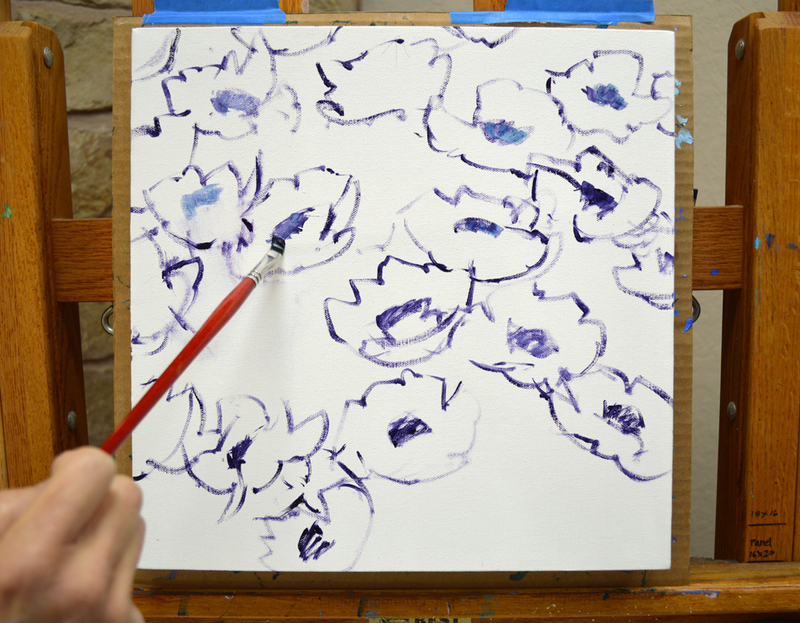 The vibrant flowers are painted with Permanent Geranium Lake + White, Permanent Rose + White and Cadmium Red Light + White. 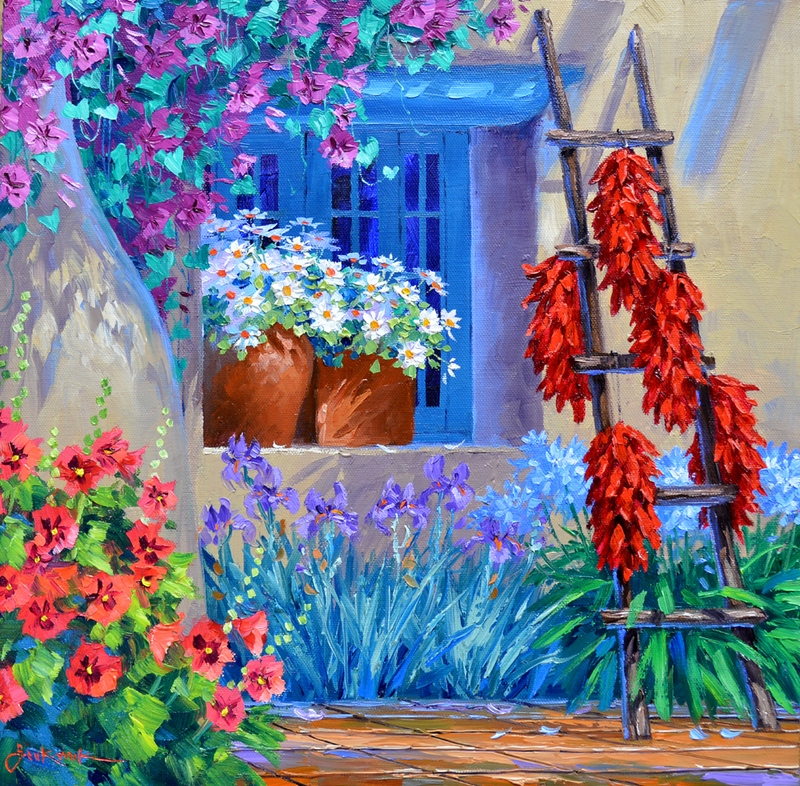 Chilis, the spice of the southwest! Let’s get busy painting the flavorful ristras. I had washed them in yesterday. That’s completely dry so now I’m adding opaque color and lots of texture. 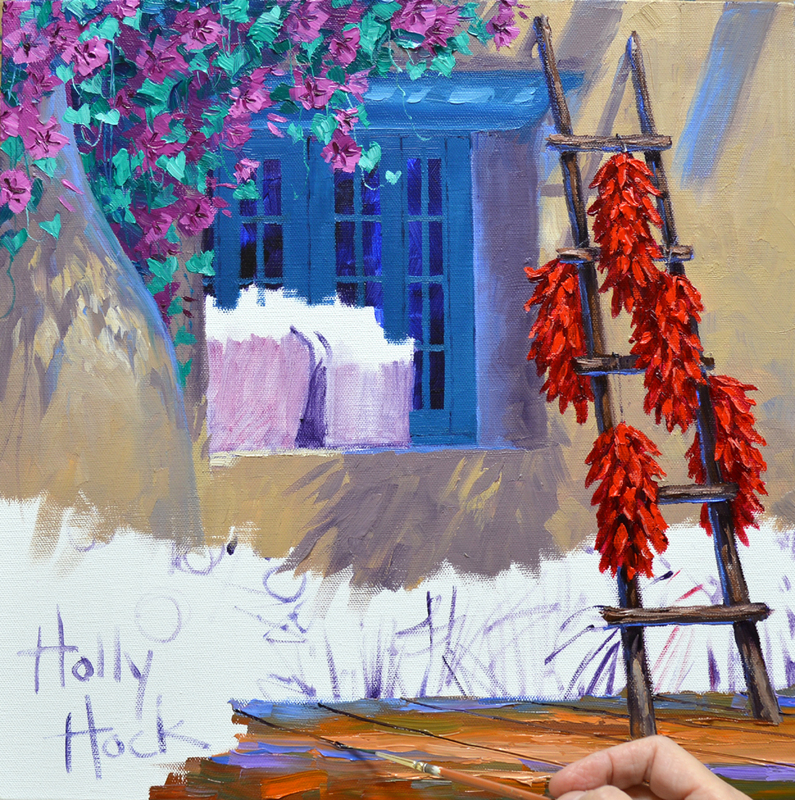 Cadmium Red Deep is used for the shadows, while Cadmium Red Medium makes the peppers in the sunlight. 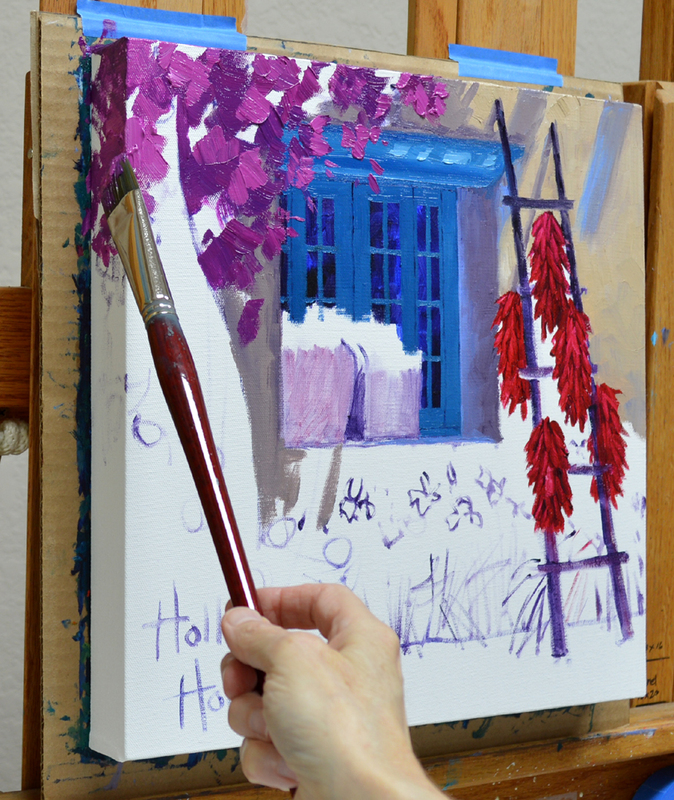 A bit of White is added to the Cadmium Red Medium for the highlights. The entire surface of the floor is painted with the light and shadows. I make the back edge bluer, or cooler, so it will drop back. 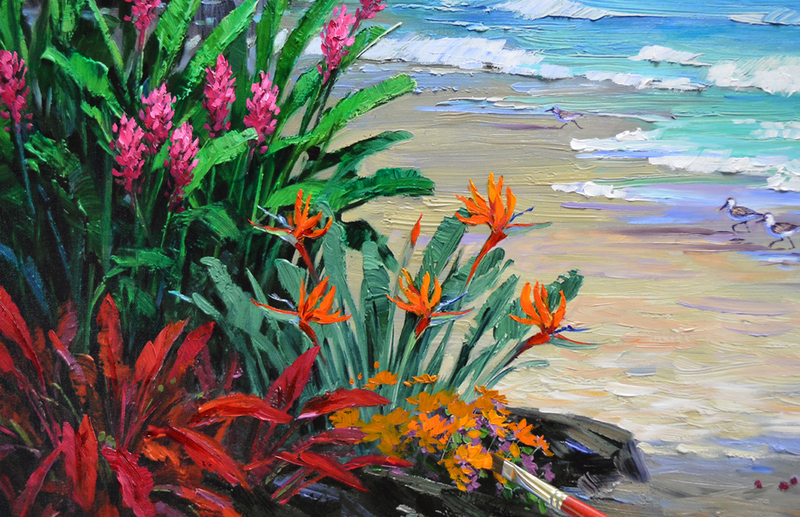 This follows a simple rule that helps to give depth to a painting: Cool Colors go Back, Warm Colors come Forward. 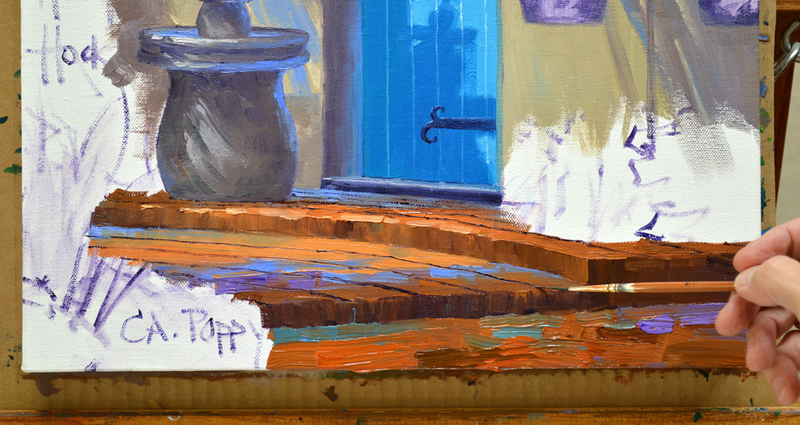 Then the perspective lines of the tiles are drawn into the wet paint. The satillo tile is finished so I move to the Irises under the window. The strappy foliage is blocked in first, then the rich purple blossoms are delineated with mixes of Dioxazine Purple + White. 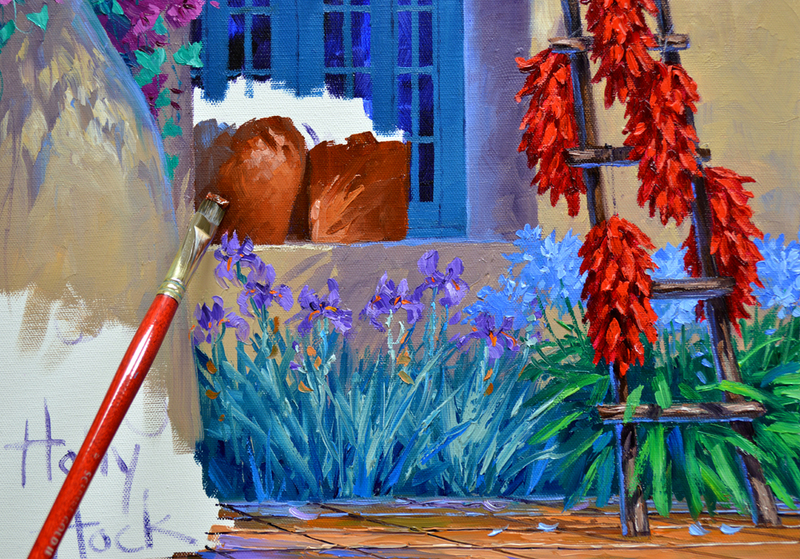 The Agapanthus is planted next, I paint the leaves around the side of the canvas. You can see how the lines separating the tiles on the floor continue over the edge. Cadmium Red Light is added to the floor color to make the terra-cotta containers. 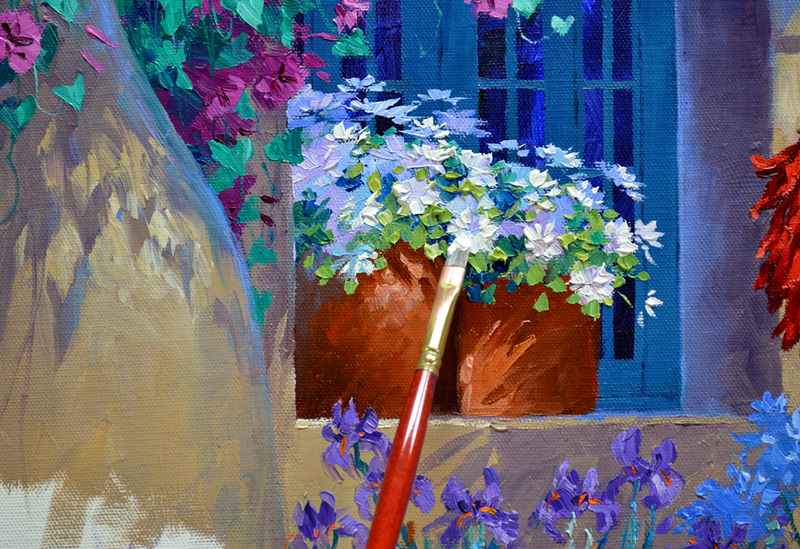 A few strokes of Ultramarine Blue + White are made on the left side of the round pot to make the edge turn back. White Daisies, some of my favorite flowers, always appear so fresh! The mass of blossoms is blocked in first with several shades of Lavender and Blue. 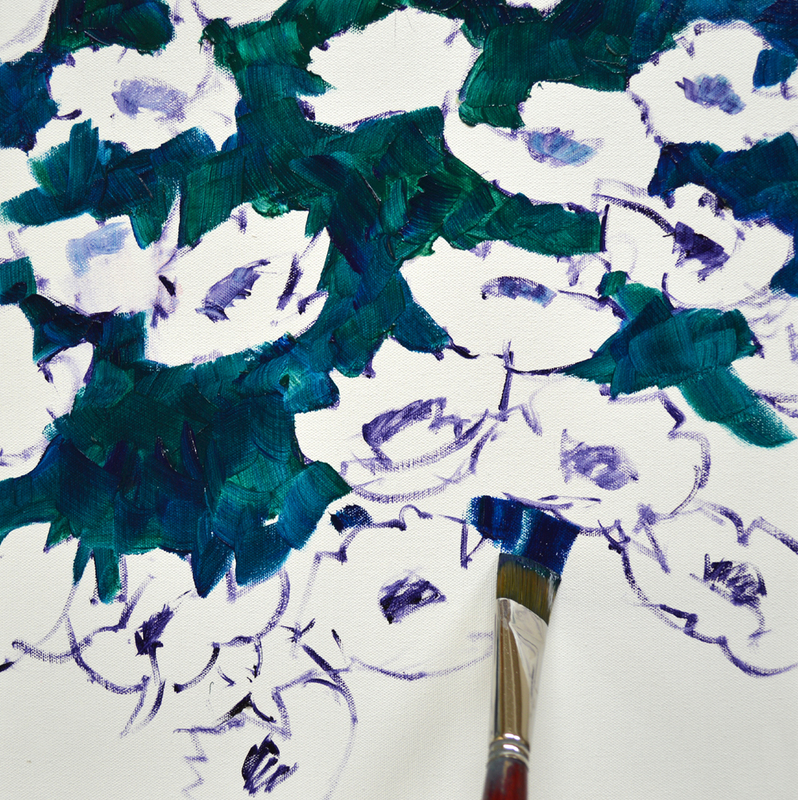 Then the leaves are painted around the white, helping to shape the individual blooms. I come back and highlight the petals in the sun with Pure White. The final step will be to add the Orange and Yellow centers. 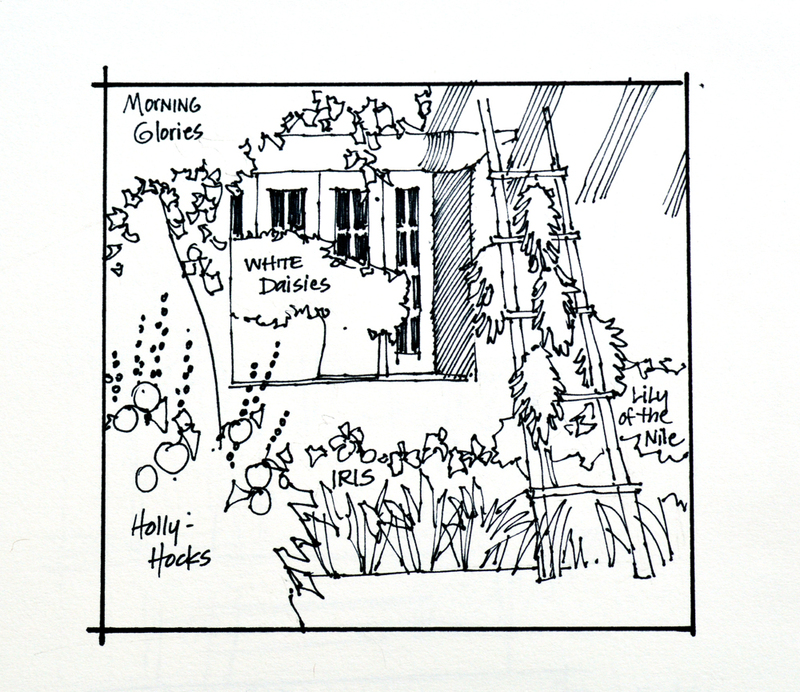 Here is the sketch for a new commission I’m starting, it will be the companion piece to Peaceful Shadows. If you’d like to see Peaceful Shadows in progress just CLICK HERE. 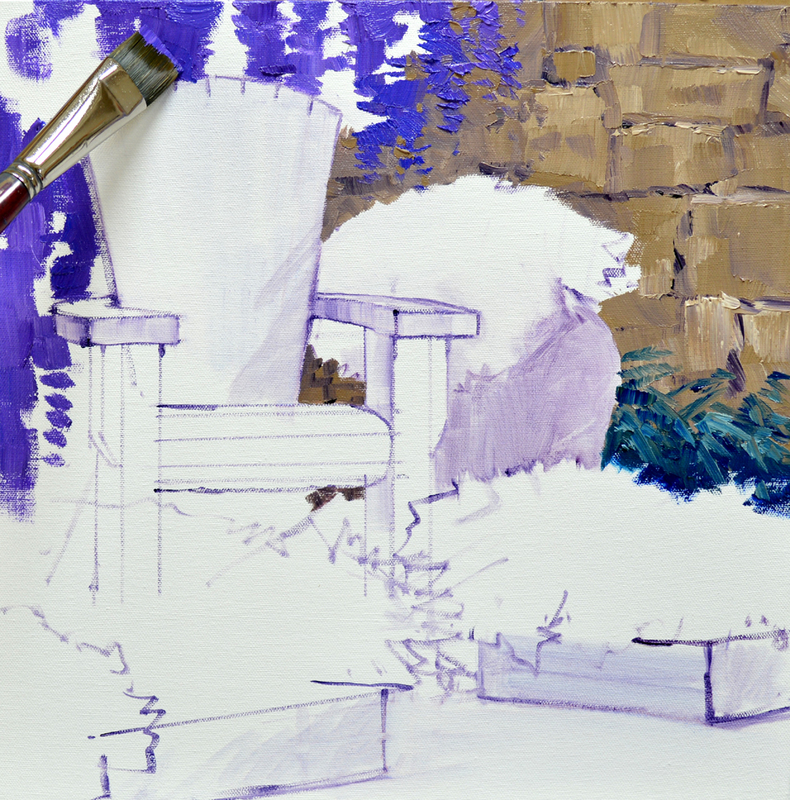 The basic plan is drawn on the canvas with a brush dipped in an oil wash of MUD (Ultramarine Blue + Alizarin Crimson) + Liquin. 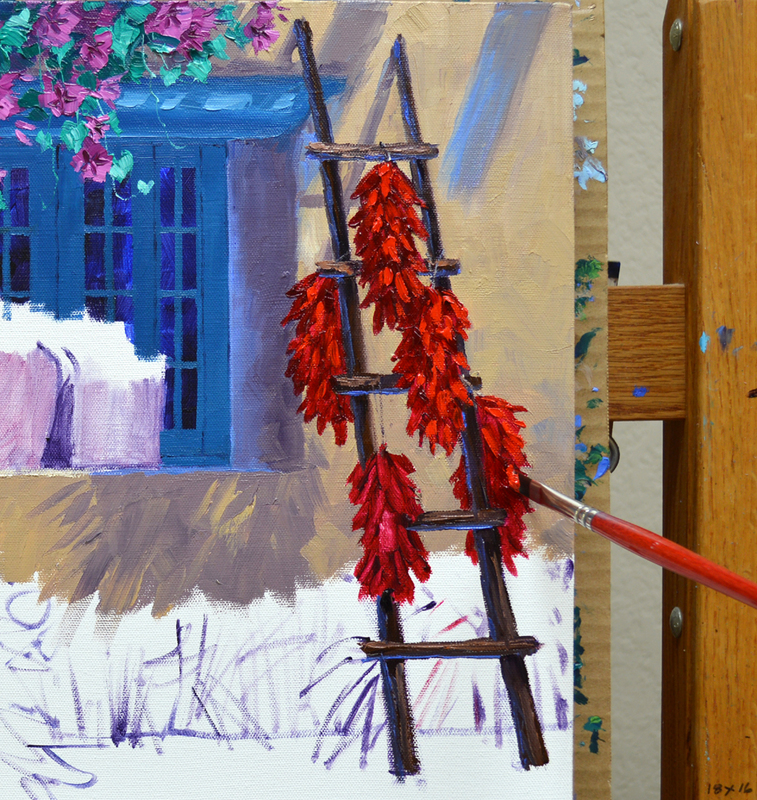 Then I wash in the base color of the chili peppers with a mix of Alizarin Crimson + Magenta + Liquin. Please remember, you can click on any of the images to see the picture larger. We’re all sketched up and ready to begin painting. 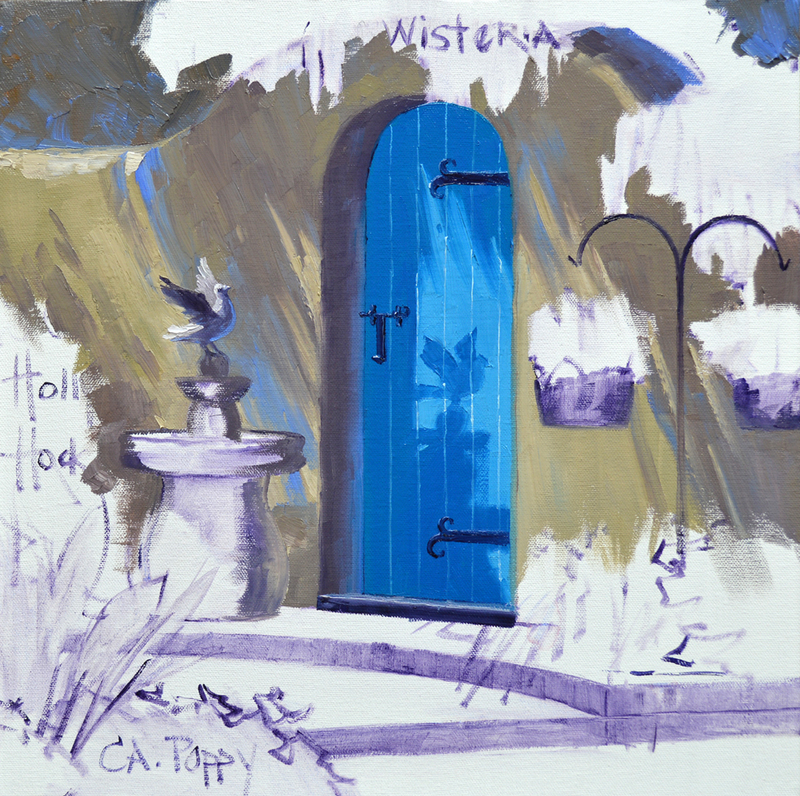 The window area is covered with MUD + Liquin and Ultramarine Blue + Liquin. I make sure the wash in is translucent. This way when the window sash and mullions are painted over the dark it will appear as if something is inside the room. 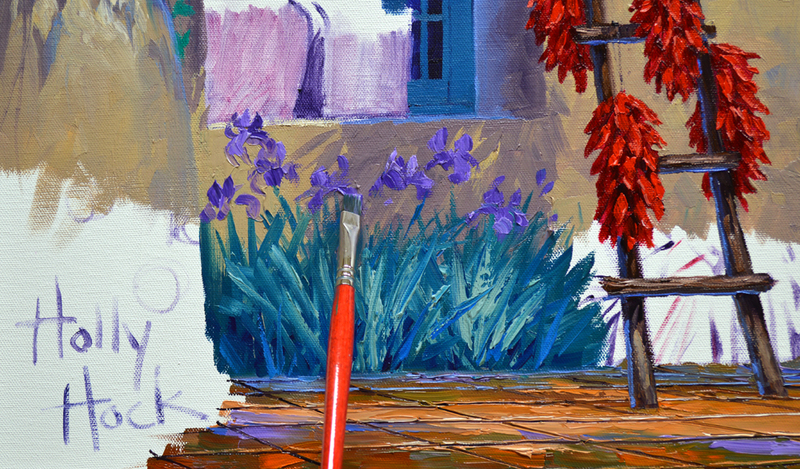 The adobe is painted first with mixes of Ultramarine Blue + Cadmium Orange + White. MUD is added into the mixture for the dark shadows. 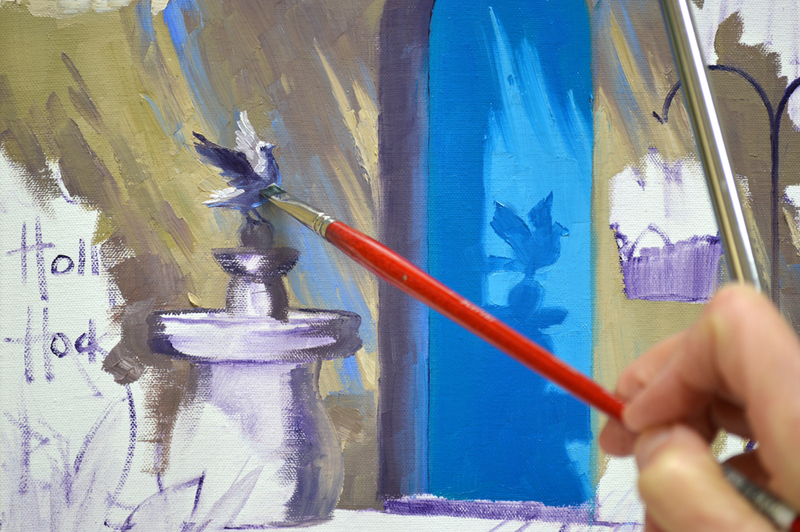 Mixtures of Pthalo Blue + Cadmium Orange + White are used for the window and the round beam over it. I brace my hand on the mahl stick in order to pull the straight line of the window frame. What is a Mahl Stick? CLICK HERE to find out! 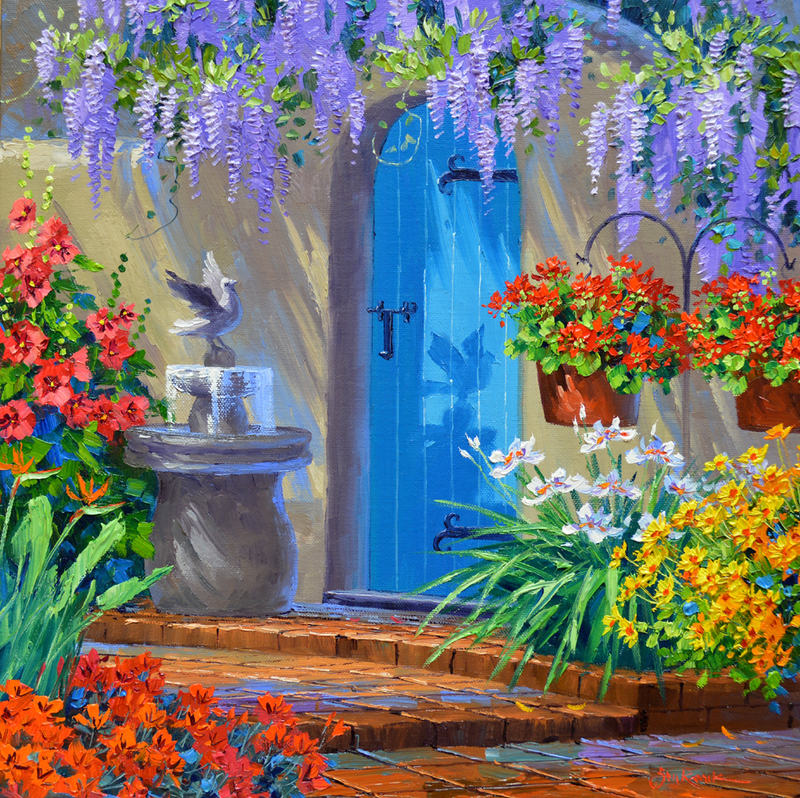 Next the cascade of Morning Glory flowers is blocked in with mixes of Magenta + White. I use various shades all smooshed together to make a variegated mass of color. 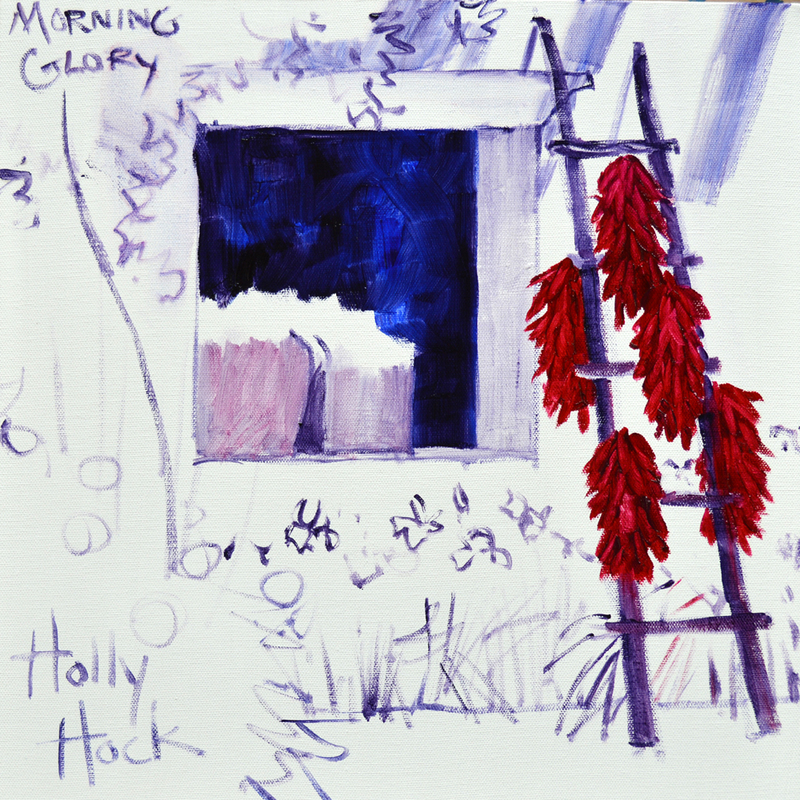 The leaves of the Morning Glory Vine are now painted. The last step today is to finish out the rounded adobe pillar. It’s especially fun making the heart shaped shadows that echo the foliage above. Thank you for following along today. AND…..If you would like to receive an email every time I publish a new post please feel free to subscribe to my blog. CLICK THIS LINK and scroll to the upper right side of the page. You will see a heading EMAIL SUBSCRIPTIONS. Just enter your email address and click the button “Sign me up!” It’s easy. And if you enjoy my blog please CLICK the FaceBook LIKE Button. As we say in Texas, “Much Obliged! My eBay auctions this week feature a trio of cactus blooms. 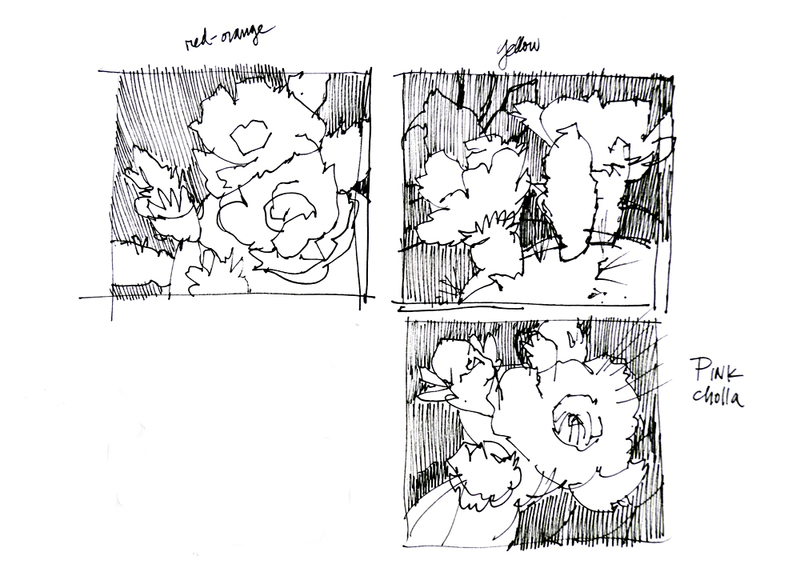 Initially a series of thumbnail sketches is made to solidify my ideas. To see this or any of the other images larger just CLICK on the picture. Then the basic outline of the design is drawn up on each panel with a thin oil wash. I draw up all three pieces at the same time making it easier to keep the size relationships consistent. The background is painted first. 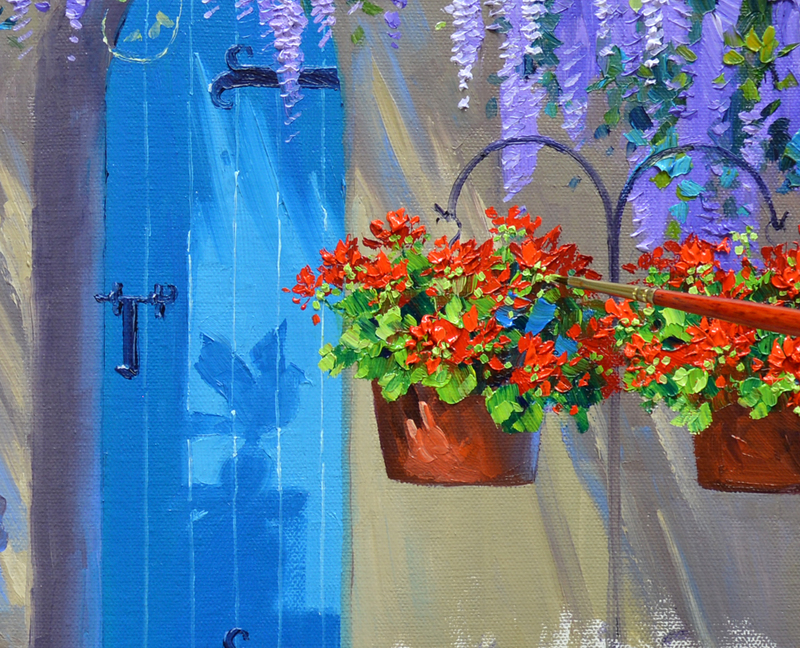 Mixtures of Pthalo Blue + Cadmium Orange + White are made with Blue being the predominant color. To lighten the mix more White is added. The glob at the bottom has the most White while the one on top has the least. 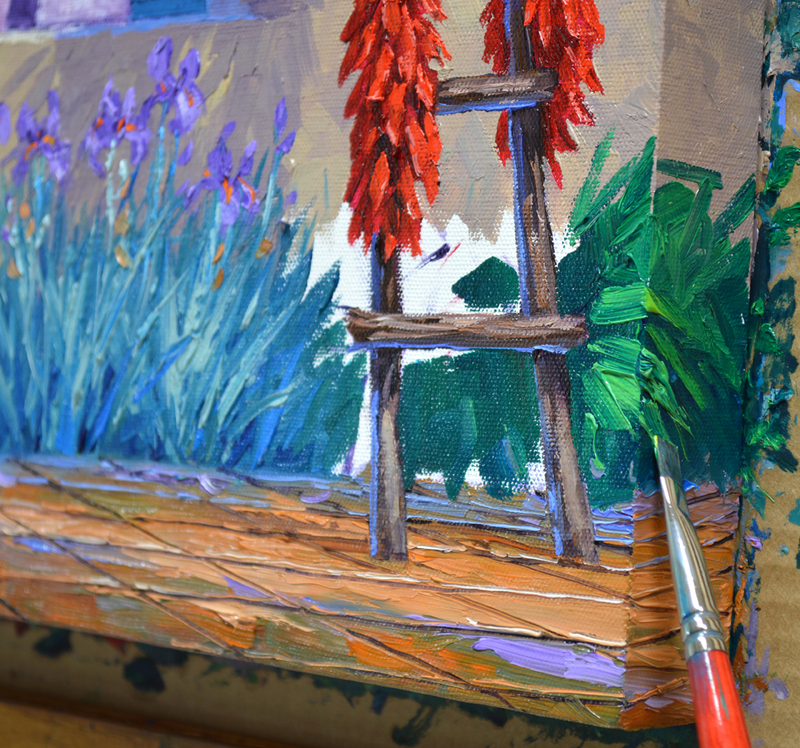 After the background is painted I begin to work on the actual cactus. The same three colors are mixed for the green pads, just in different proportions. Much more Cadmium Orange is added to make the mixtures greener. 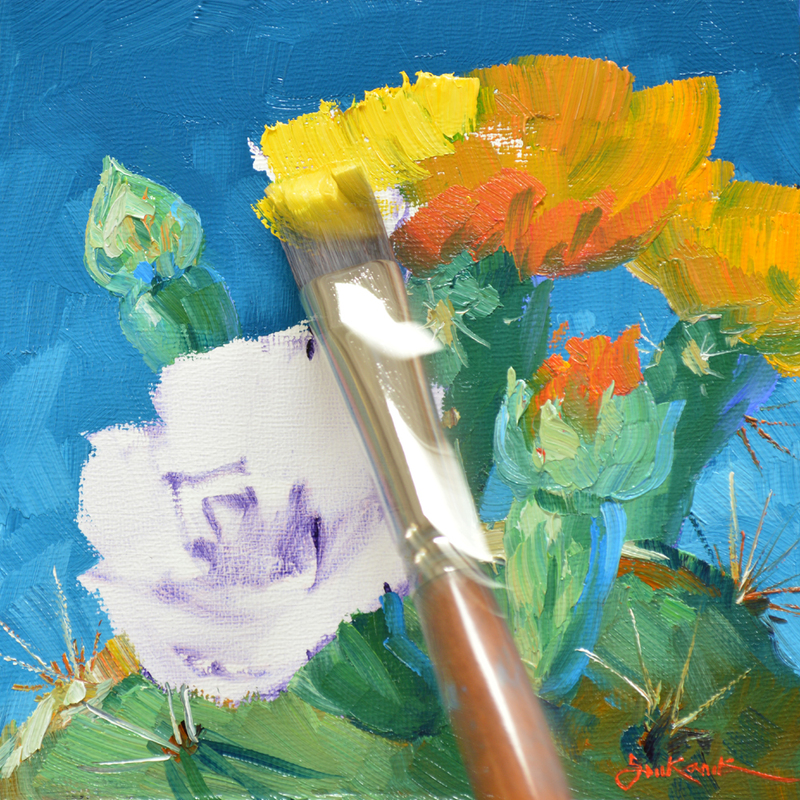 The fine thorns are pulled directly into the wet paint, allowing for smooth, thin lines. Now for the POP of color. 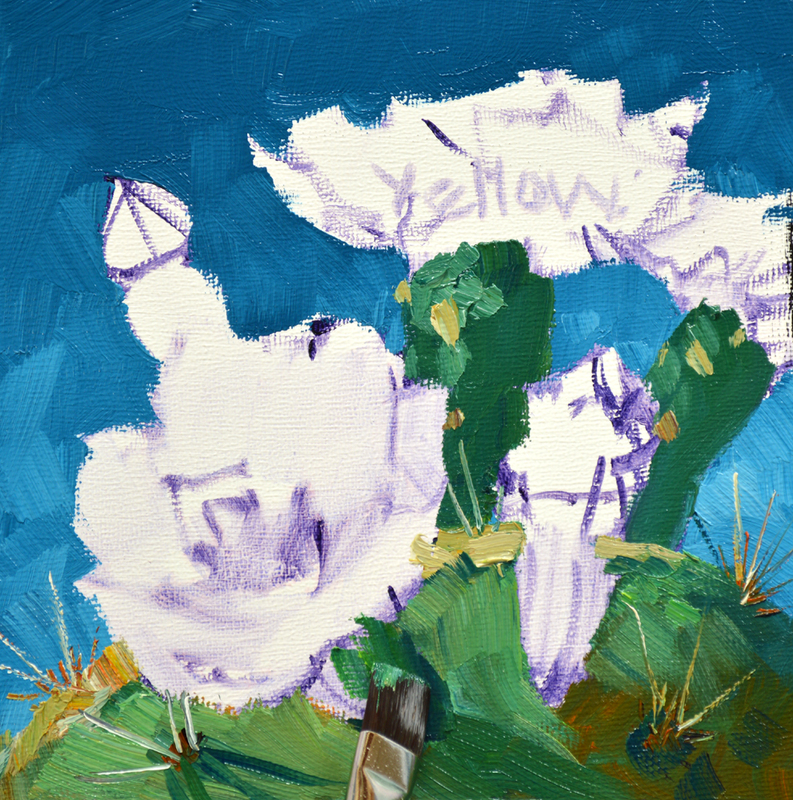 The vibrant flowers explode against the muted colors of the background and cactus. We usually don’t equate brilliant color with the desert. But let it rain and WOW! 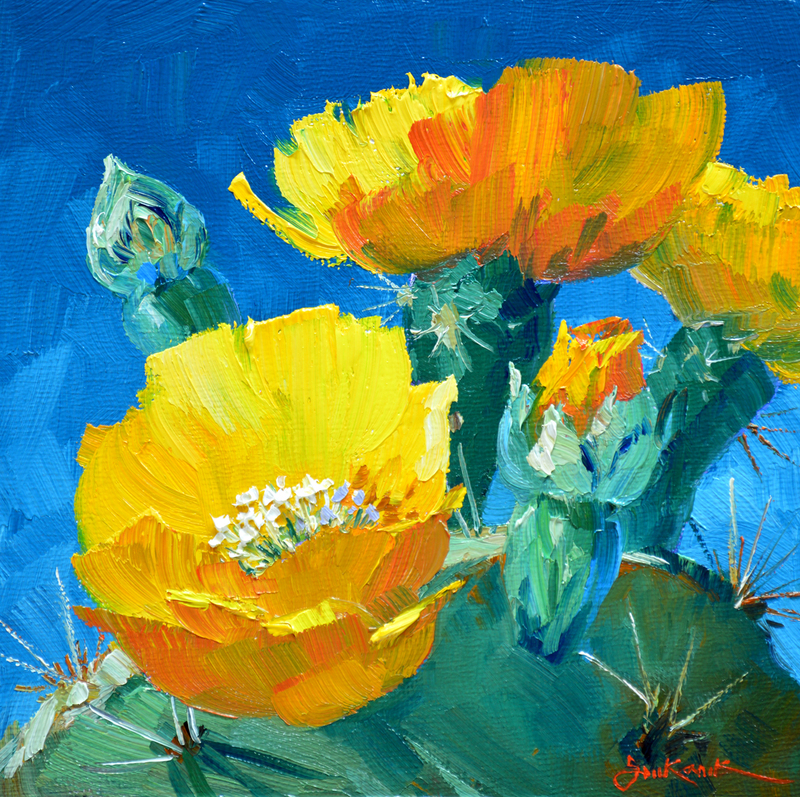 The muted grey greens of the desert provide a beautiful compliment to the intensity of the colorful flowers adorning the cacti. Bring a spot of color into your life with these incredibly yellow Prickly Pear cactus blooms that magically appear After the Rain. When the desert bursts out in bloom it looks as if the cacti are decorated with brilliant jewels. 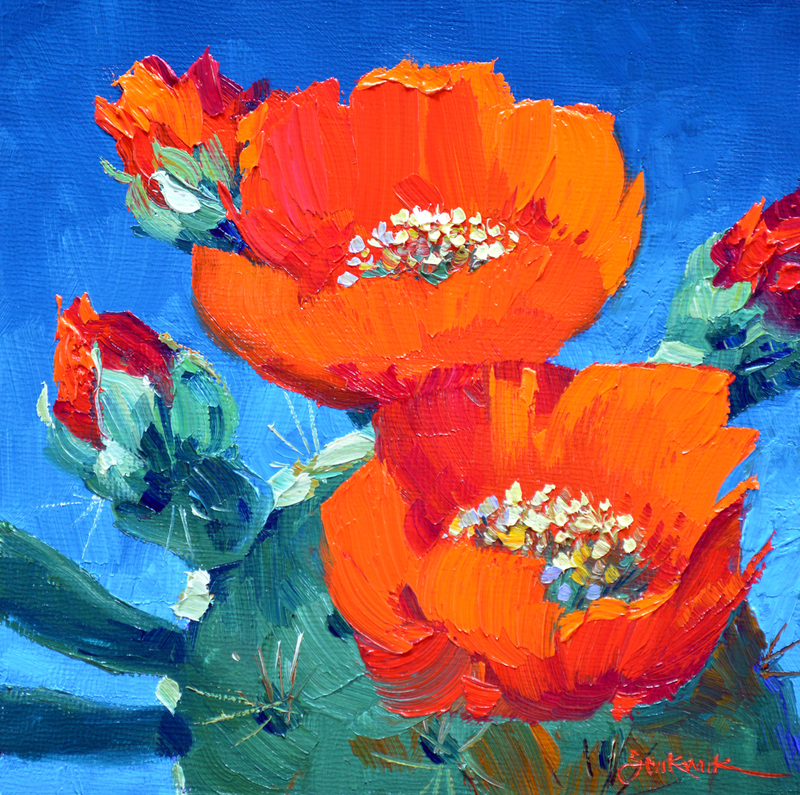 Let Desert Gem adorn your home with the vivid, jewel like color of a Prickly Pear Cactus flower. I’m so glad we had the opportunity to live in Carefree, Arizona for a few years and experience the seasons in the Sonoran Desert. Rain is so precious, monsoons make the normally subtle cacti explode into brilliant blooms. 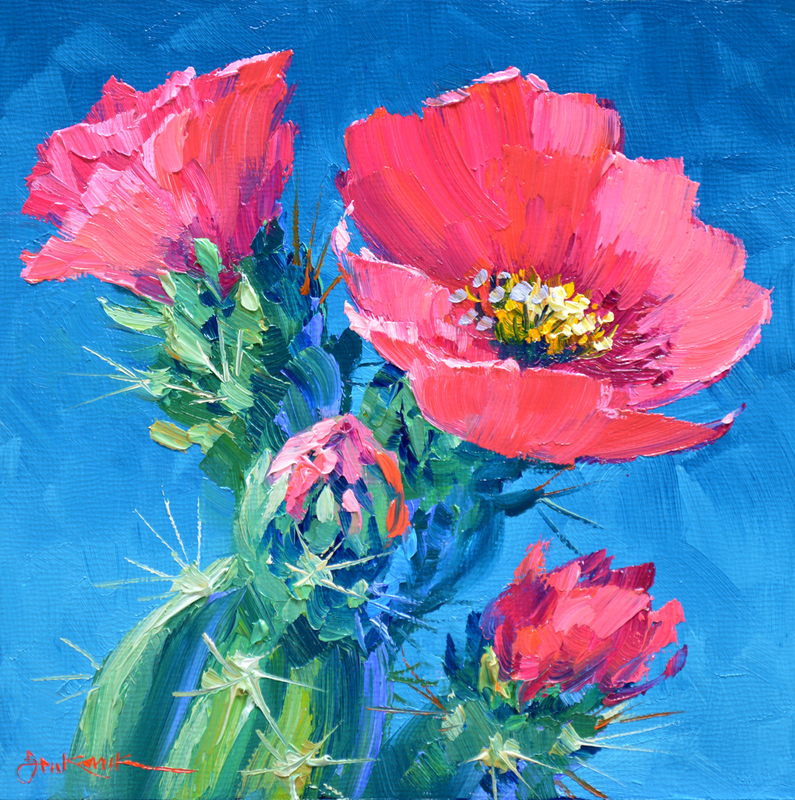 Let the Precious Color of the intense pink blossoms of a Cholla Cactus brighten up your wall. Why do we call these EMBRYOS? Having earned a Master’s degree in Medical Illustration from the Medical College of Georgia, I’ve illustrated 47 major Medical, Anatomy and Surgical Textbooks. In honor of my Medical background these charming 6 inch by 6 inch baby oil paintings are called EMBRYOS. They are new, fresh ideas that have yet to be “birthed” into a larger gallery piece. Don’t worry about framing, each is on a cradled panel with finished sides, ready to hang up on your wall. Add a spot of color in your home with one or several, these collectible EMBRYOS hang nicely in groups. Christmas is right around the corner. EMBRYOS make wonderful gifts that will bring smiles for years to come. Precious Color, After the Rain and Desert Gem are designed to hang individually or as a triptych. Bring the “Jewels of the Desert” to your home. These original oil paintings retail in our galleries for $390 each but to make it more fun we are starting the bidding on all three auctions at 1 cent. That’s right, ONLY A PENNY! The auctions are staggered 7 minutes apart so you can win one or all of the Original Oil Paintings to hang on your wall. AND…..If you win the entire set we will give you FREE SHIPPING! But don’t wait too long, the auctions end Sunday evening beginning at 8 PM Central Time! 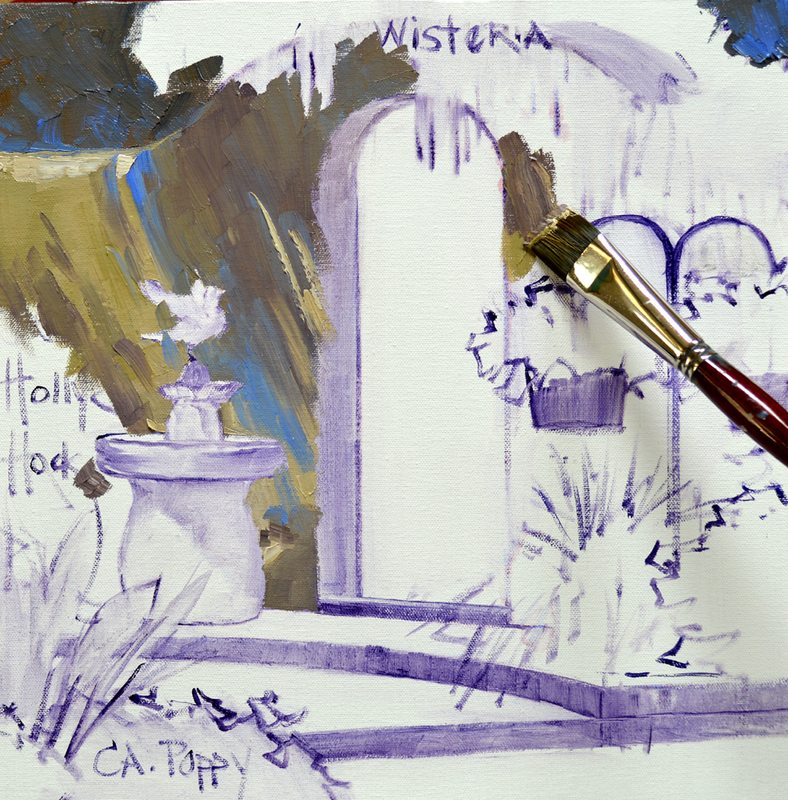 The flowers of the Wisteria are blocked in with Dioxazine Purple + White. Then the leaves are painted around the blossoms. 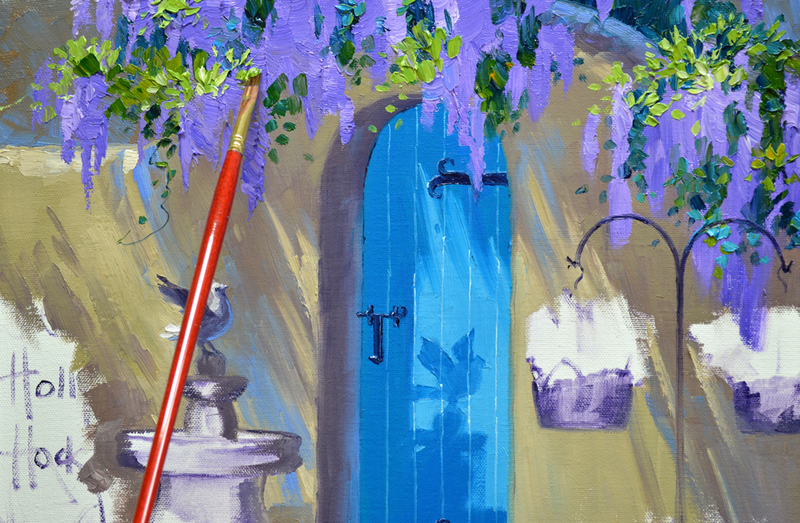 I come back and paint the individual petals of the Wisteria. I let the lacy blooms drape down over the adobe wall and gate. A few wandering tendrils of the vine are drawn with a fine liner brush. The surface of the floor is painted with thick brushstrokes, establishing the light and shadow pattern on the rough pavers. Then I draw the curved perspective lines into the wet paint of the floor. 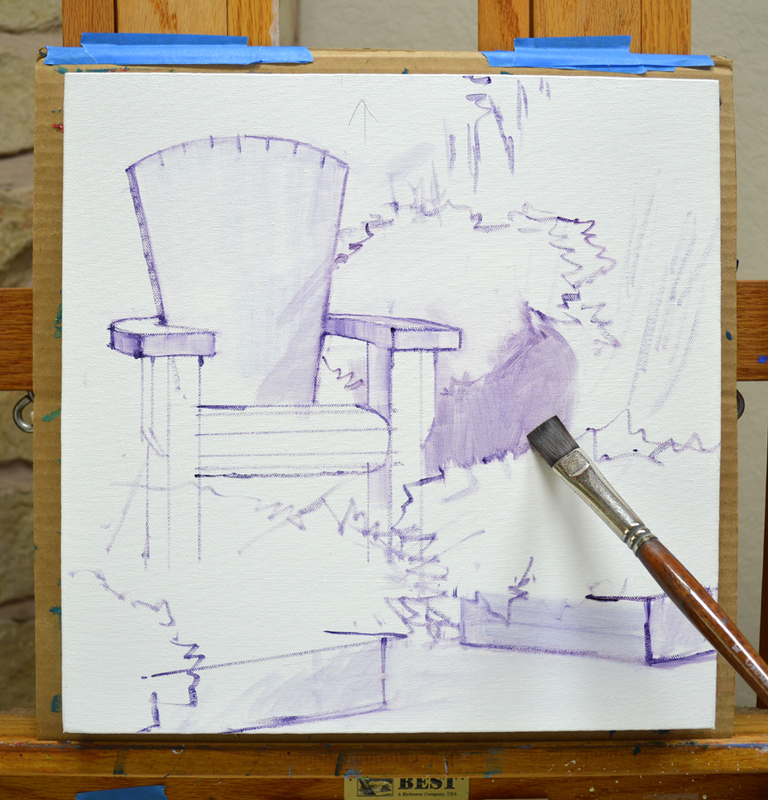 After I finish drawing the lines separating the pavers I go ahead and sign the painting while the floor is still wet. It would be hard to pull a smooth line over dry, bumpy paint. 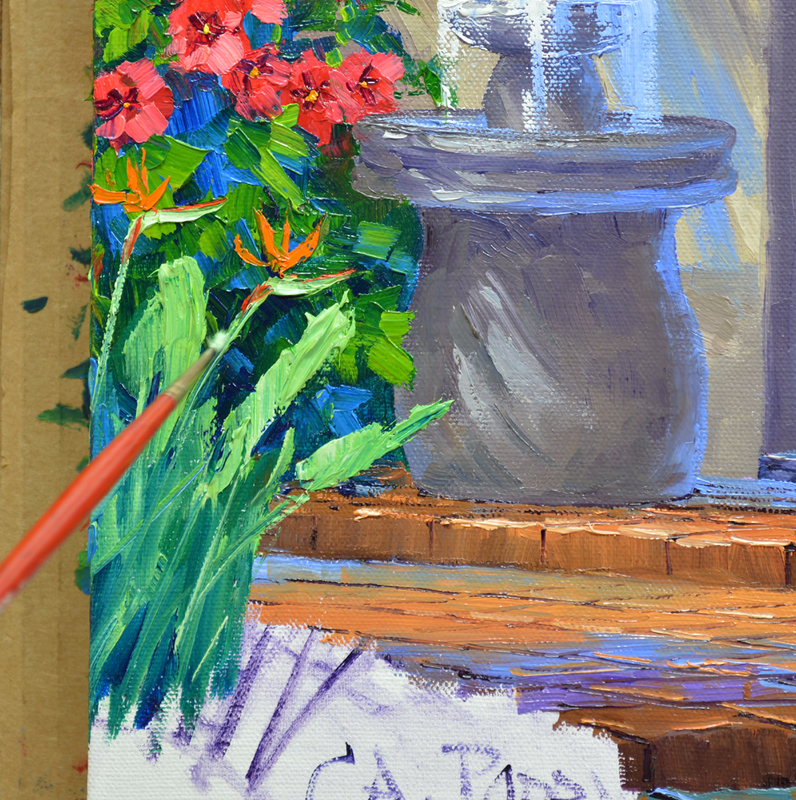 Next the flowers of the Geraniums are roughed in with Cadmium Red Deep, Cadmium Red Medium and Cadmium Red LIght. Leaves, stems and flower buds finish out our Geraniums hanging on the Shepherd’s hooks. The Hollyhocks are painted with a special color, Geranium Lake. 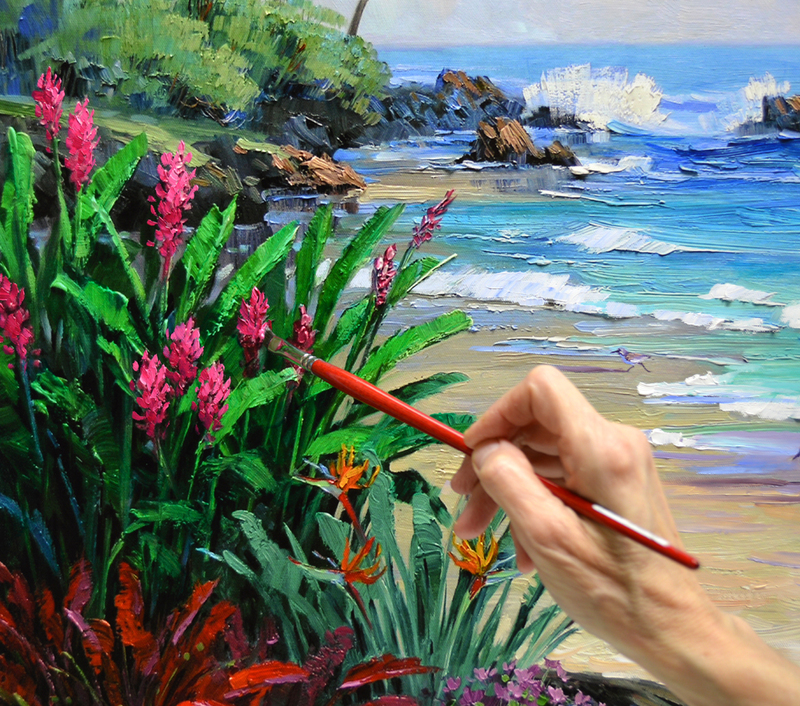 I work the flowers over the edge and onto the side of the canvas. Birds of Paradise are accentuated by the dark foliage of Hollyhocks in the background. The long strap-like leaves of the Butterfly Iris are now painted. 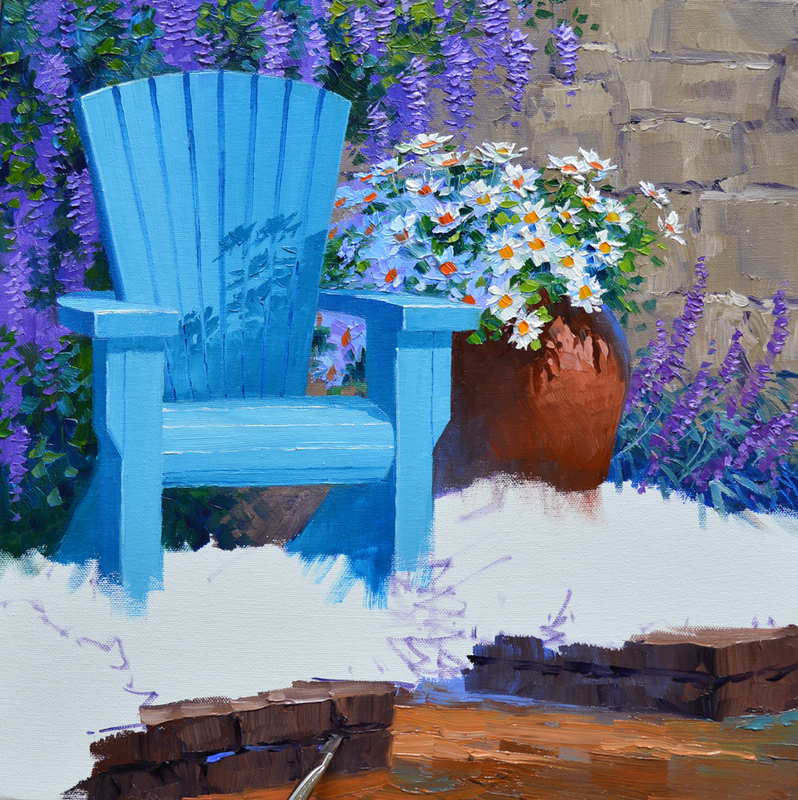 Peaceful Melody was one of the pieces that sold at our annual collector event in Santa Fe. Some long time collectors from New York really liked it but didn’t mind that it was already spoken for, they actually needed their painting to be a different size. After visiting awhile we decided on a 14″ x 14″ embryo, painted around the sides. Bill and Sarah wanted to maintain the basic theme of the original piece, just make it square. So here is my sketch in the new format. 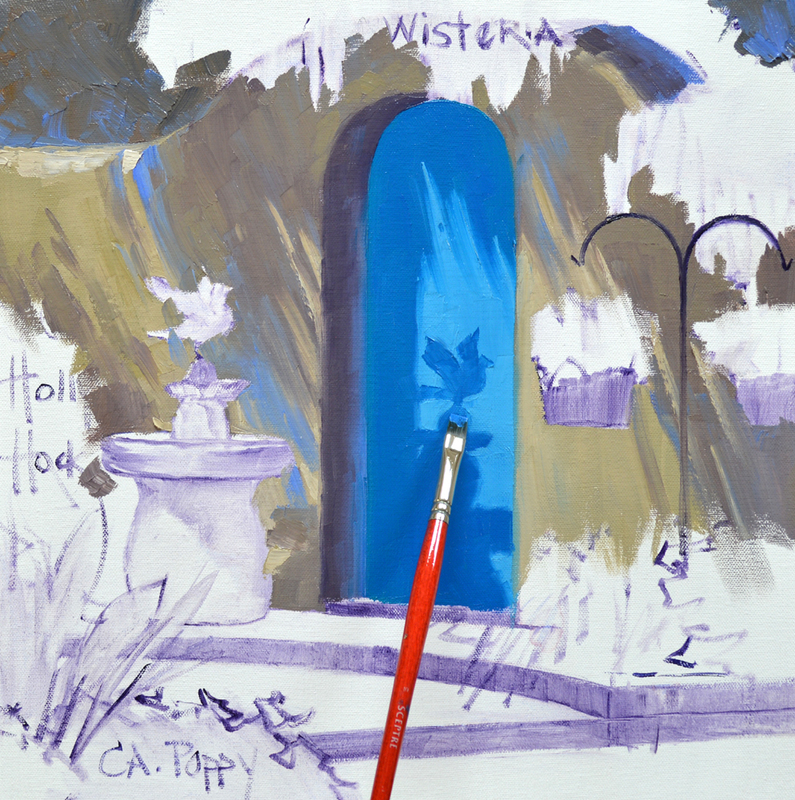 The initial plan is sketched up on the gallery wrap canvas with a brush dipped in a thin oil wash of MUD (Ultramarine Blue + Alizarin Crimson) + Liquin. The canvas is attached to cardboard so it will be easier to handle when the painted sides are wet. 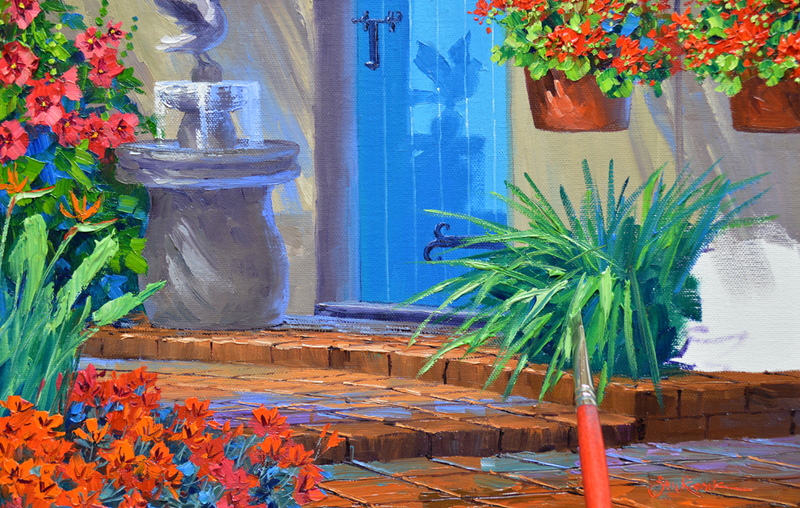 After painting the background with a cool adobe color, I start blocking in the courtyard wall with a warmer version. The mixtures for the distant adobe are various proportions of Ultramarine Blue + Cadmium Orange + MUD + White. For the front wall more Cadmium Orange is added to the mixes, making it warmer. 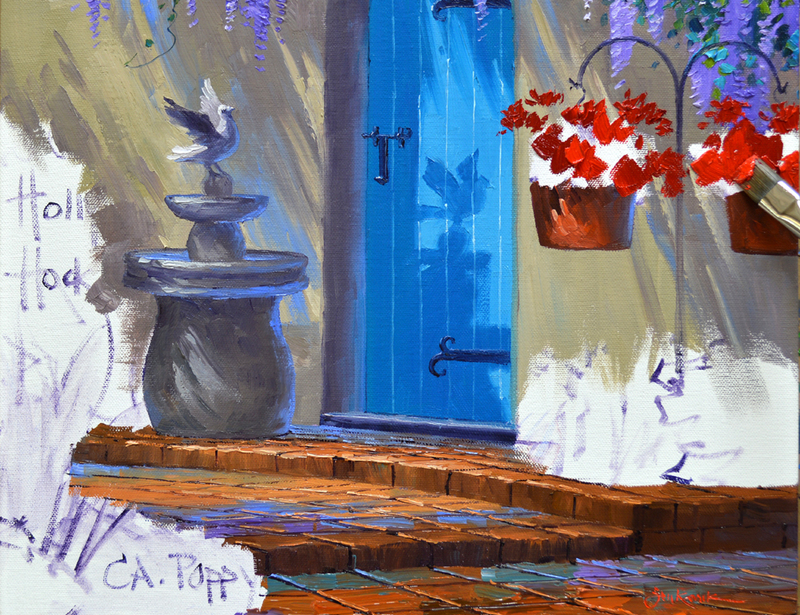 I’ve decided to show more of the shadow cast by the fountain on the wooden gate which is painted with light and dark shades of Pthalo Blue + White. 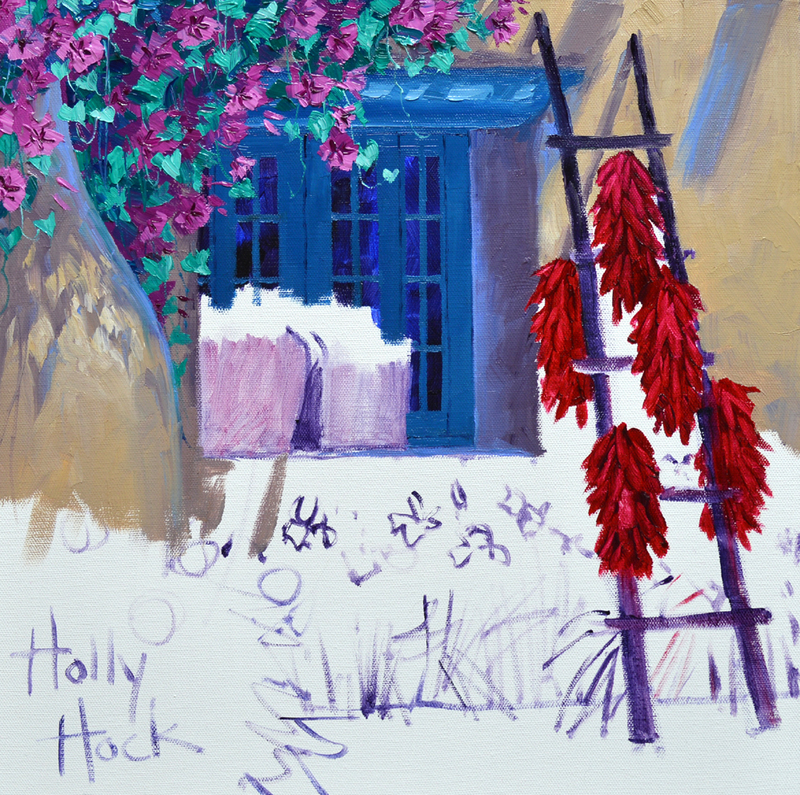 It’s fun to work elements from our garden into my paintings. When we were looking for a fountain to put in our garden I fell in love with this one. 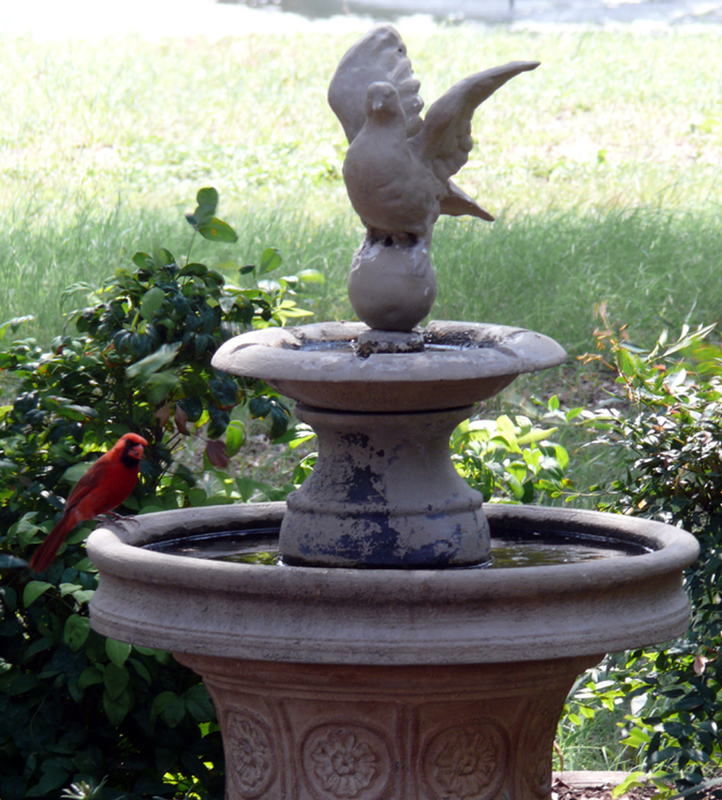 Our resident Northern Cardinal, Mr. Chippers, has adopted the dove as his personal perch and the basin is his private bath! 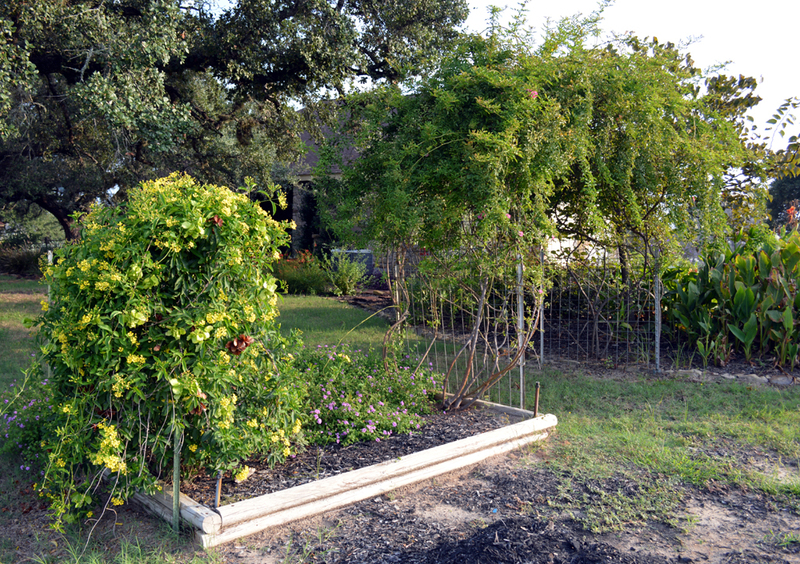 Our garden is flourishing now the blast of summer heat has past. 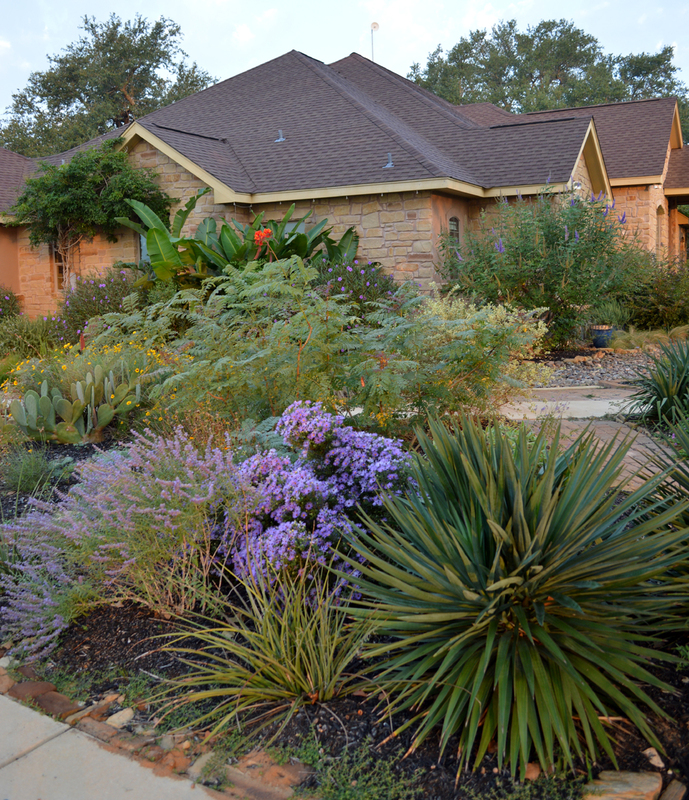 Russian Sage and Purple Asters fill the bed by the drive. Orange Pride of Barbados are starting their second bloom of the season, while Green Thread’s bright yellow blossoms peek out from behind the cactus on the left. The purple tree closer to the house is a Vitex, also known as Texas Lilac. 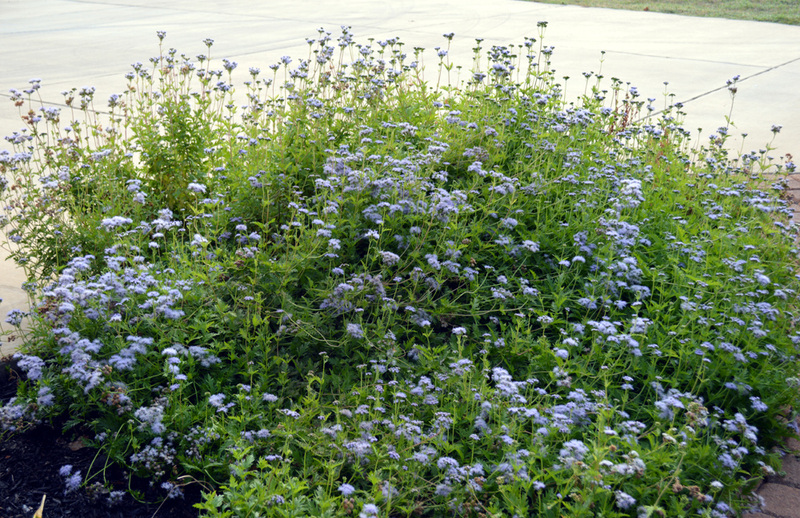 Our Blue Mist has exploded into bloom. Please remember, if you would like to see any of the pictures larger just click on the image. 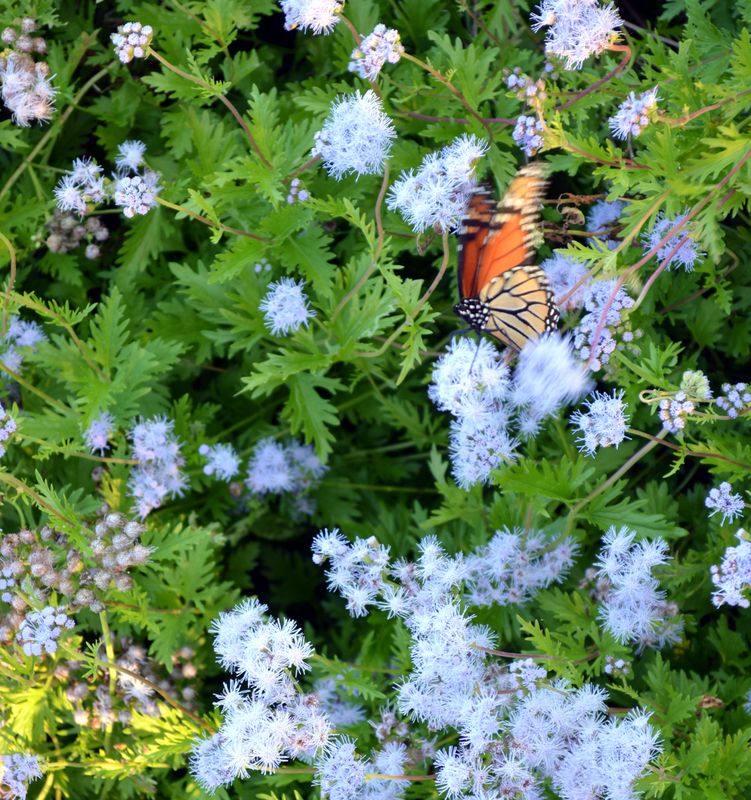 The Monarchs drifting through our area feast on the feathery flowers of the Blue Mist. The Mexican Butterfly Vine gives late summer color, a pretty counterpoint to the spring blossoms of the pink Peggy Martin Rose on the arbor. The seed pods of the vine look like Butterflies. They turn brown as they dry and we collect them to use as Christmas Tree decorations. 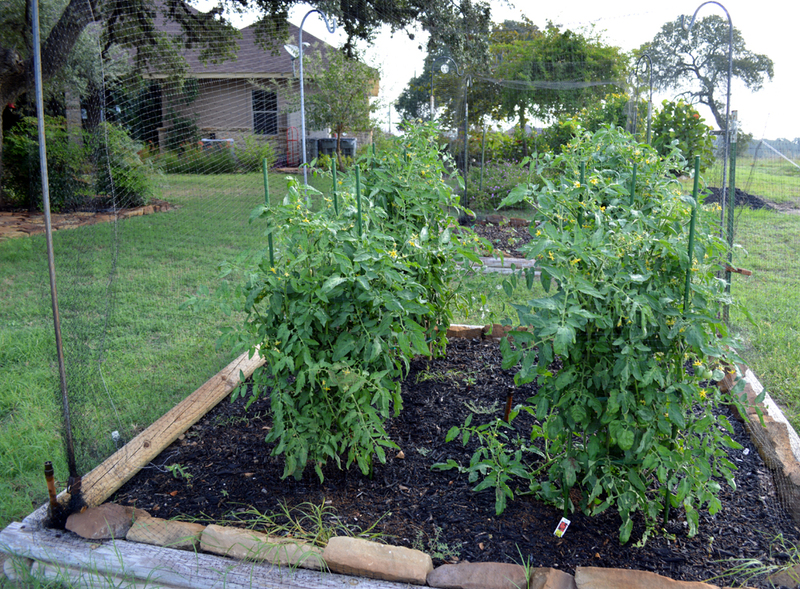 Our fall tomatoes are in and it looks like we’ll have fresh ones for Thanksgiving. Maybe even a few before then. We hope :). 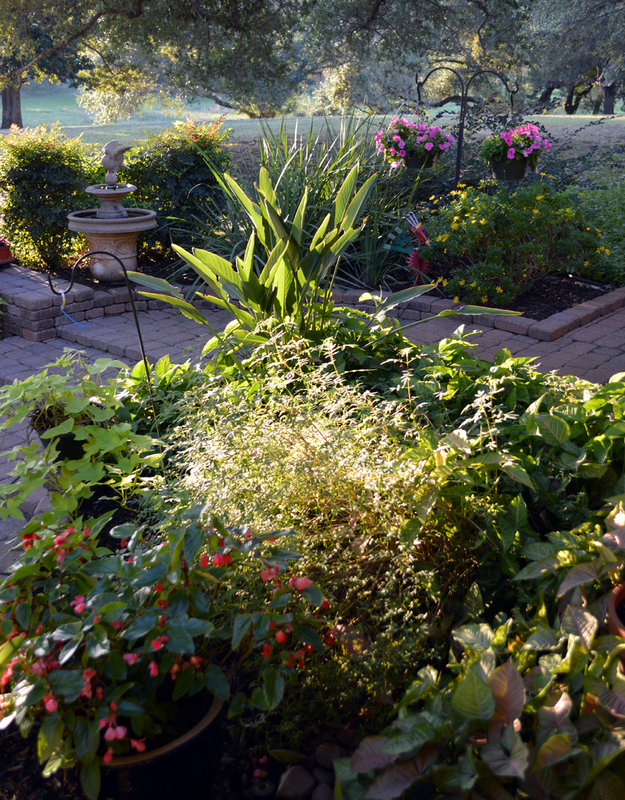 Walking up to the back porch as the sun drops in the late afternoon is a visual treat. 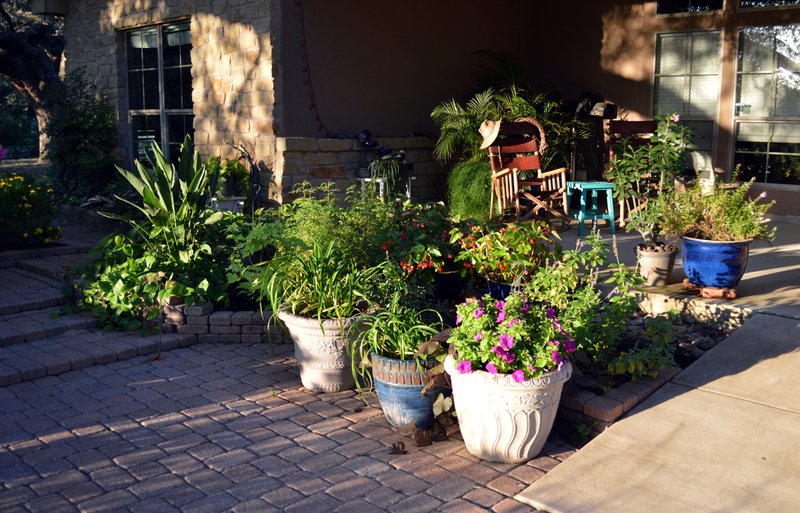 Looking out from the porch is even prettier, all the plants glow in the back lighting of the sun! Thought we’d take a break from painting today and share just a little of our fall with you. The Danes also saw the painting above, Muy Caliente, at our gallery event. 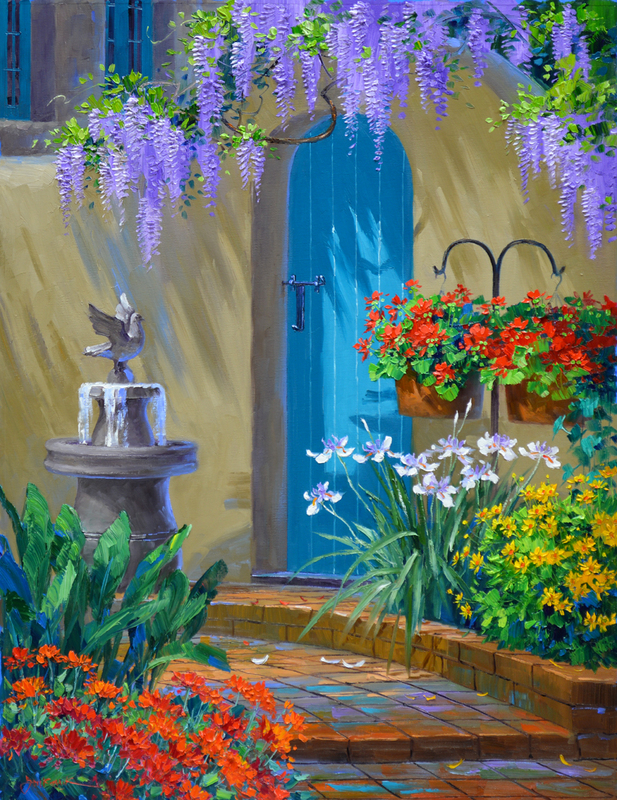 Like Immersed in Spring it had already sold. So they commissioned me to do one for them as a companion to their Daisy painting, shown in my previous blog. 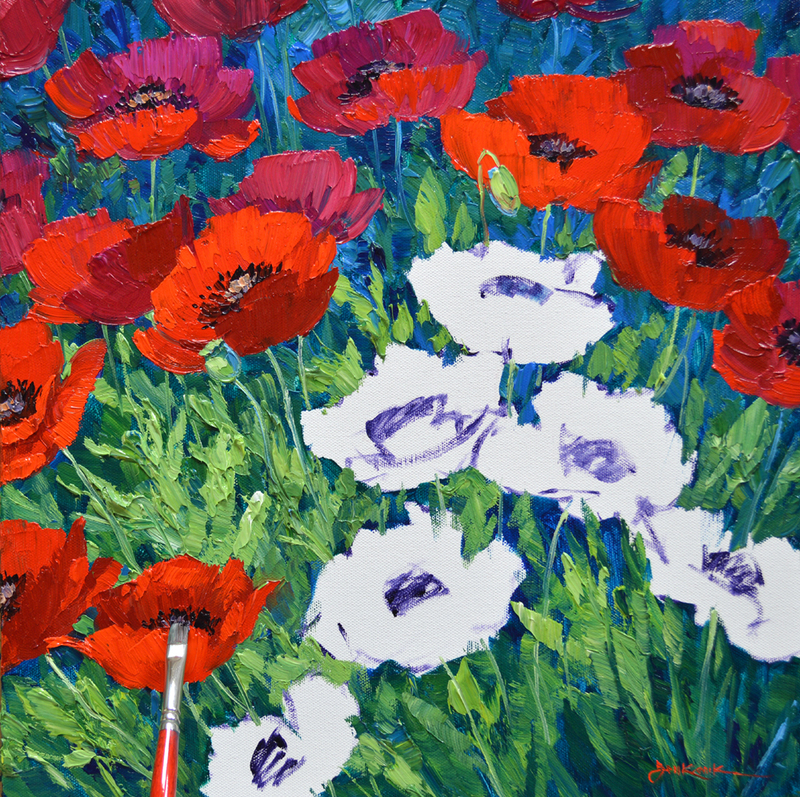 I flip the composition and change the position of several of the poppies. 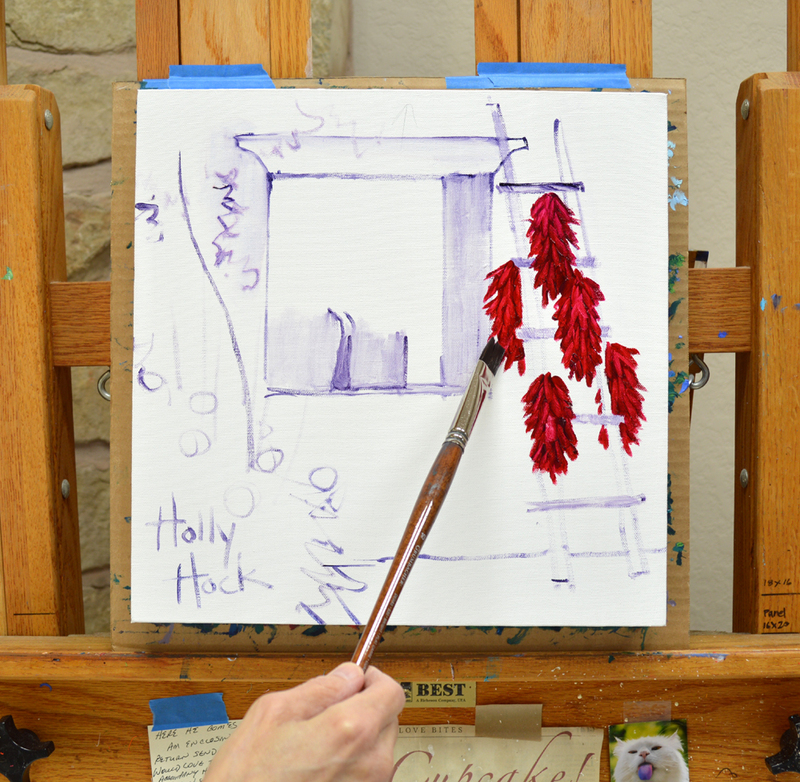 The initial plan is sketched on the canvas with a brush dipped in a thin oil wash of Ultramarine Blue + Alizarin Crimson + Liquin. 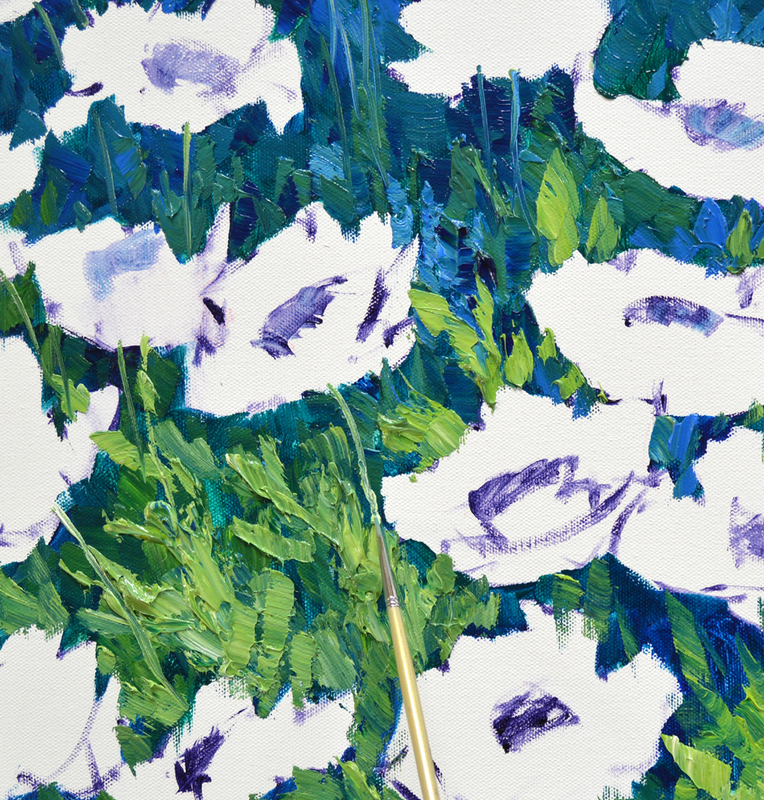 The background between the flowers is blocked in with oil washes of Viridian Green + Liquin and Pthalo Blue + Liquin. This gives a cool base for the leaves of the Poppies. 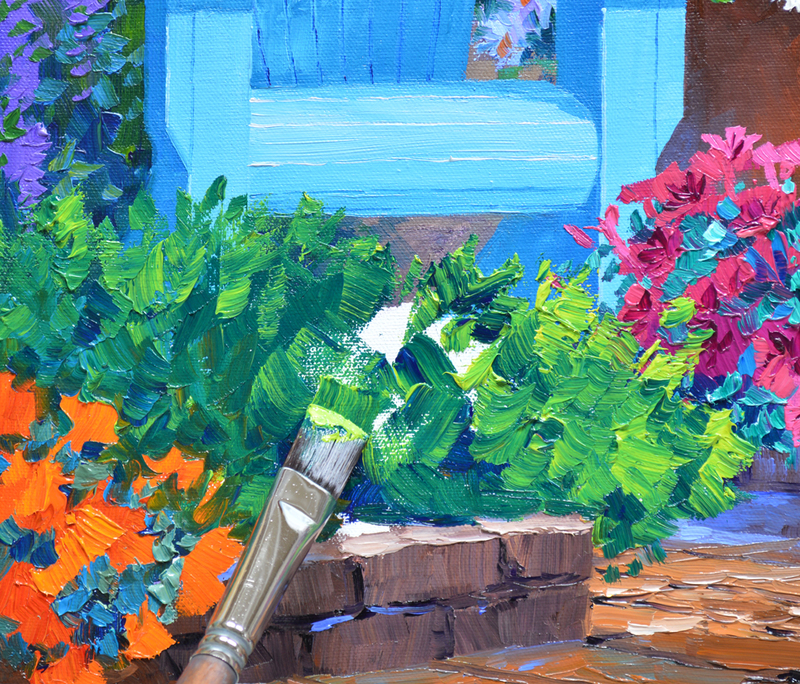 Coming back with various mixes of Pthalo Blue + Cadmium Orange + White and Pthalo Blue + Lemon Yellow + White I paint the foliage with thick, textured brushstrokes. 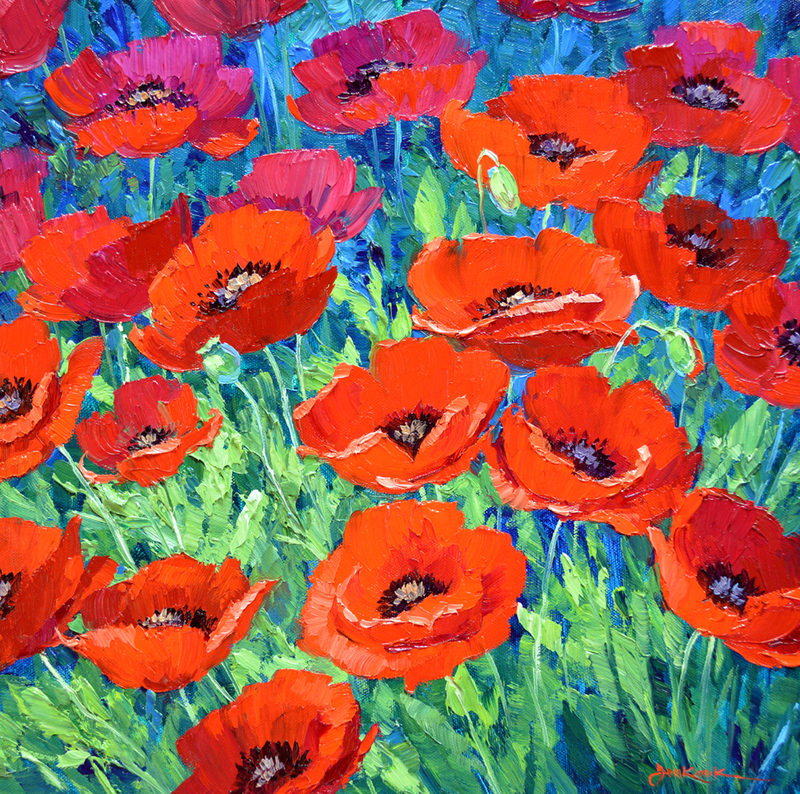 The thin stems of the poppies are then drawn into the wet paint of the mass of leaves. 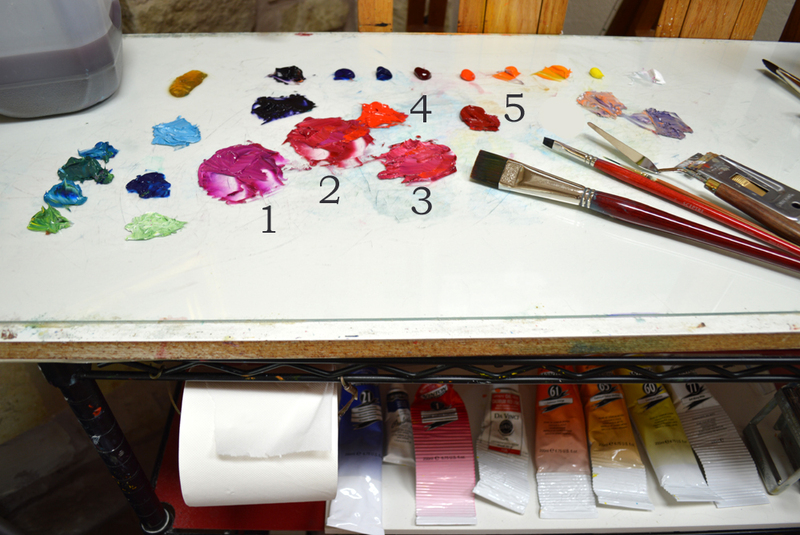 The mixes for the Red Corn Poppies are laid out on my glass palette, placed on top of a culinary cart with wheels. The shelf below holds the tubes of paint used for our double primary color mixing system. If you would like to learn more about it CLICK HERE. Now for the mixtures. #1 – Magenta + White. 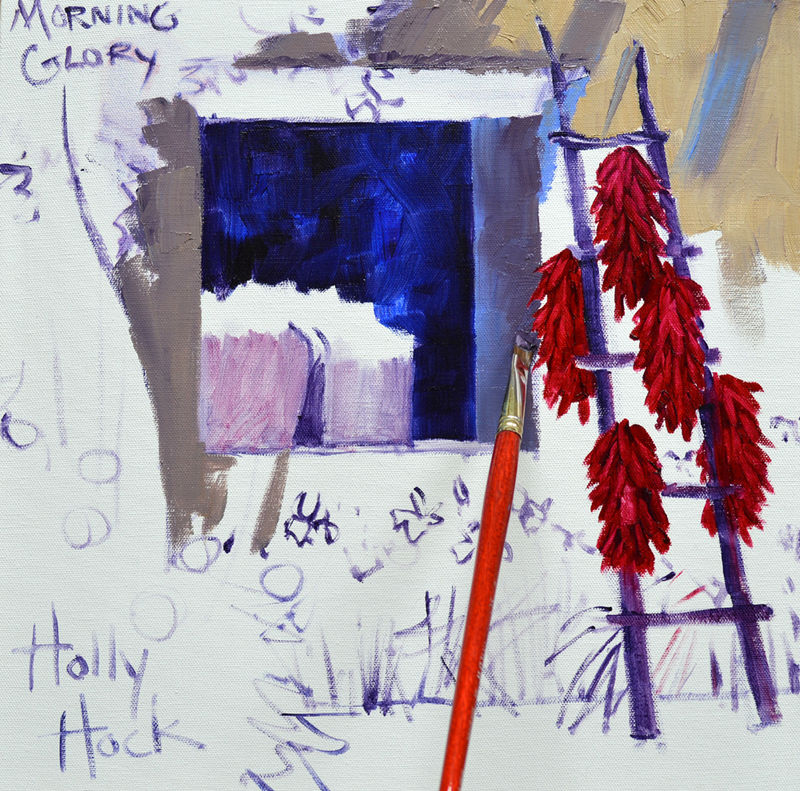 #2 – Alizarin Crimson + White. #3 – A lighter mix of #2. #4 – Cadmium Red Light. #5 – Cadmium Red Deep. 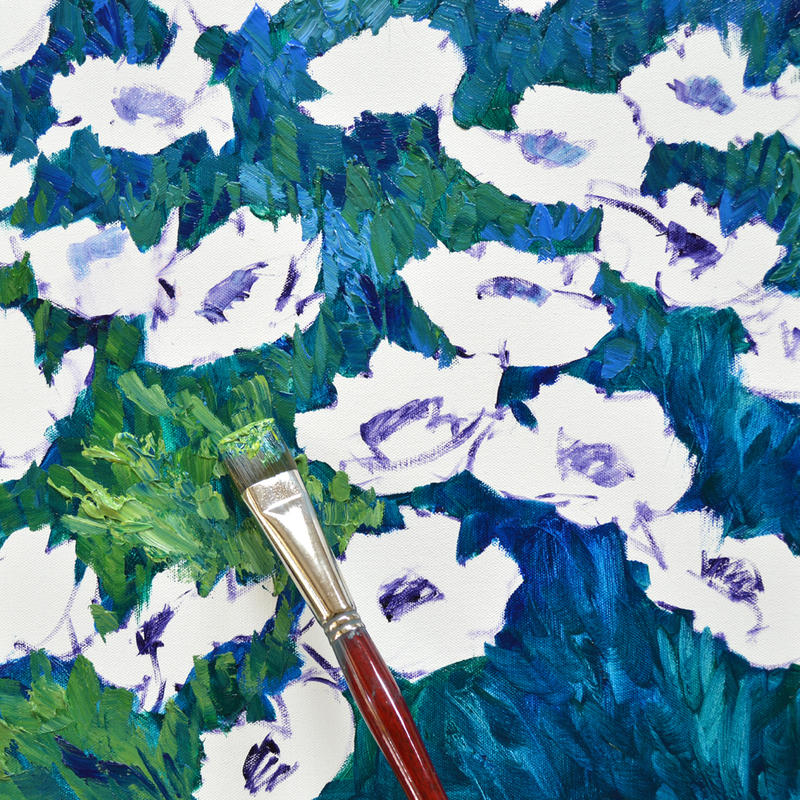 The Poppies in the distance at the top of the canvas are painted with mixes #1, #2 and #3. These are cooler Reds that will drop back. Moving closer to the foreground I begin incorporating mixes #4 and #5 into the blossoms. The warm reds jump forward. 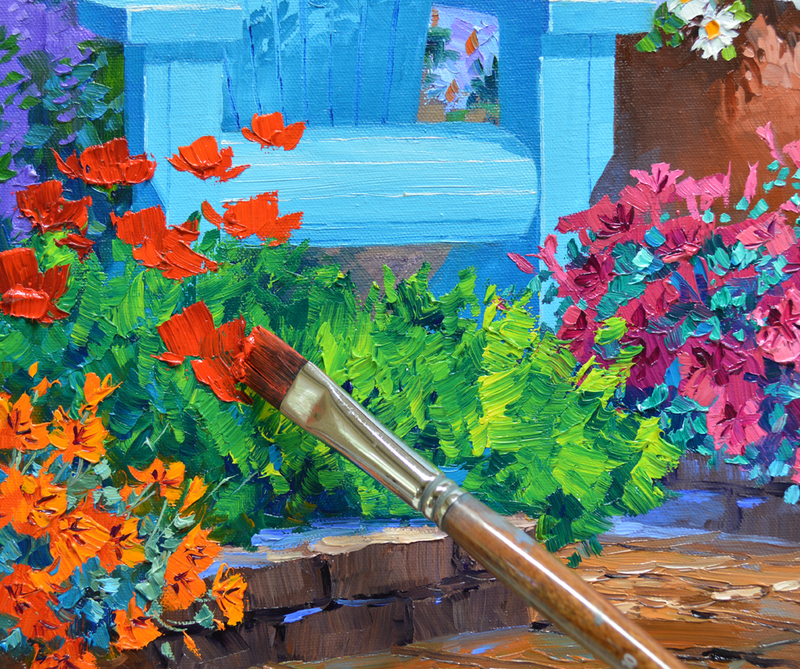 This follows a simple rule that helps to give depth to a painting: Warm Colors come forward, Cool Colors go back. Adding the dark center completes each flower. Now, let’s begin working on the floor and planters. The entire area of the paver floor is painted letting the sunlight slide across the surface from the right. The sides of the brick planters are blocked in, then the crevices between the bricks are indicated. The lines separating the rough pave stones of the floor are loosely delineated and the edges catching the sunlight are highlighted. You can see how the lines in the floor continue around the side of the gallery wrapped canvas. 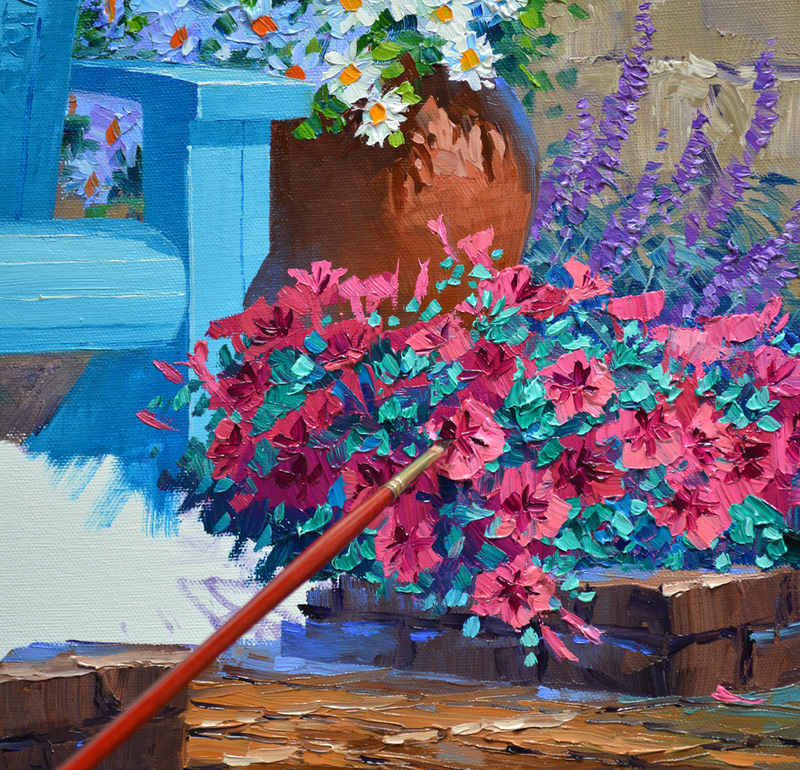 The pink Petunias are blocked in with several mixtures of Magenta + Permanent Rose + White and Permanent Rose + White. 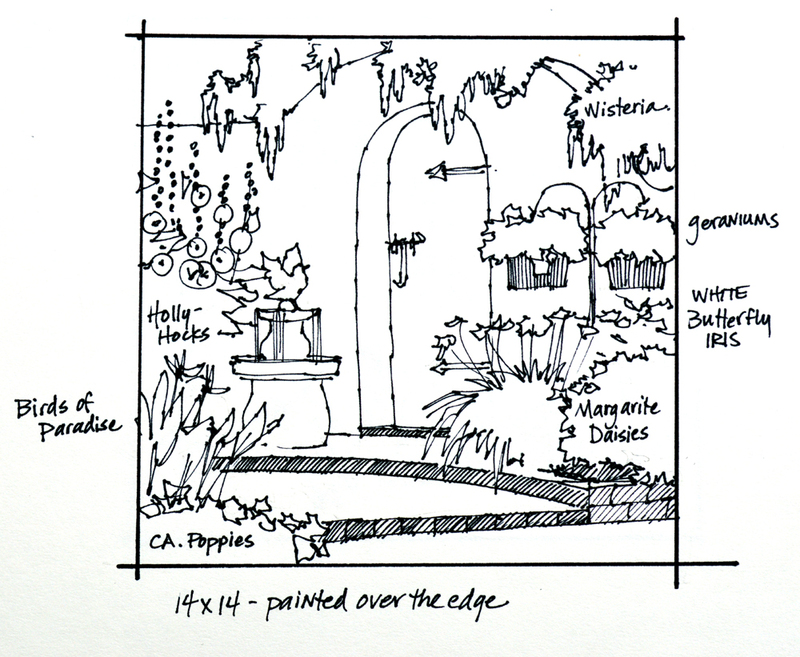 After the foliage is painted I go back and draw in the deep centers of the Petunias with a brush dipped in Magenta. California Poppies brighten the lower left corner. The blossom color has been painted with Cadmium Orange + Cadmium Red Light, Cadmium Orange and Cadmium Orange + Cadmium Yellow Medium. Foliage is painted around the flowers, continuing the design around the side. 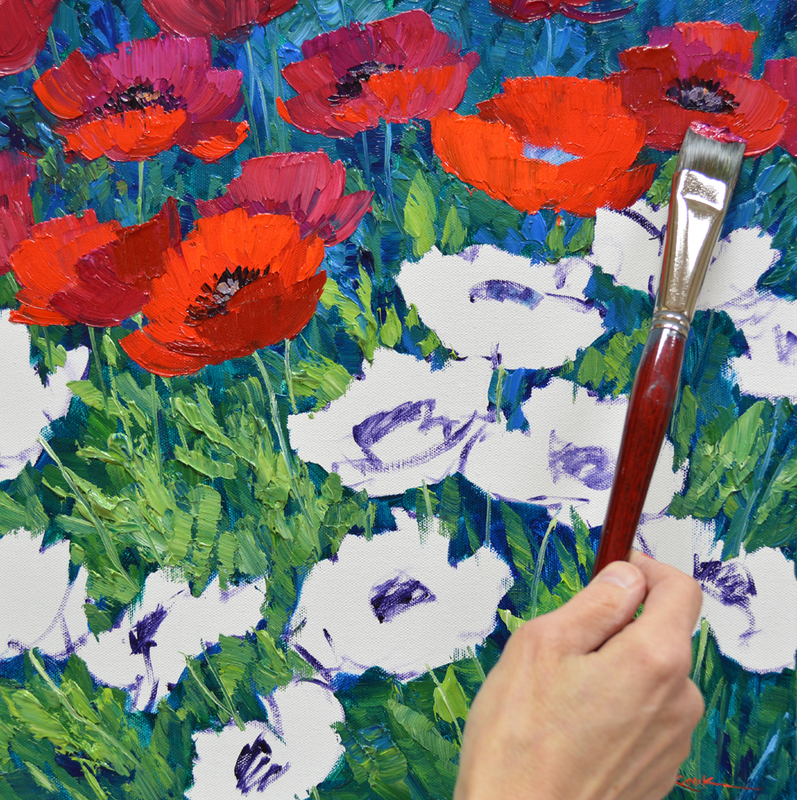 The intense green leaves of the Red Corn Poppies are painted with mixes of varying amounts of Pthalo Blue + Lemon Yellow. 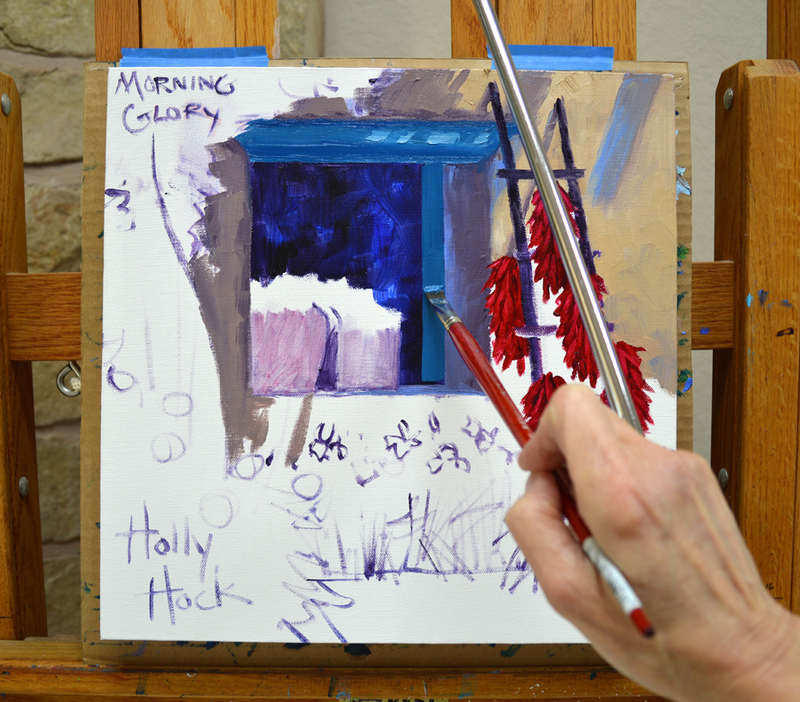 Thick brushstrokes of Cadmium Red Deep + Magenta and Cadmium Red Medium are gently “Laid” on top of the green. I have to be careful not to pick up any of the color underneath as it will dull the flowers. One of my readers pointed out the blossoms without stems look like butterflies. That’s pretty cool. What do you think? 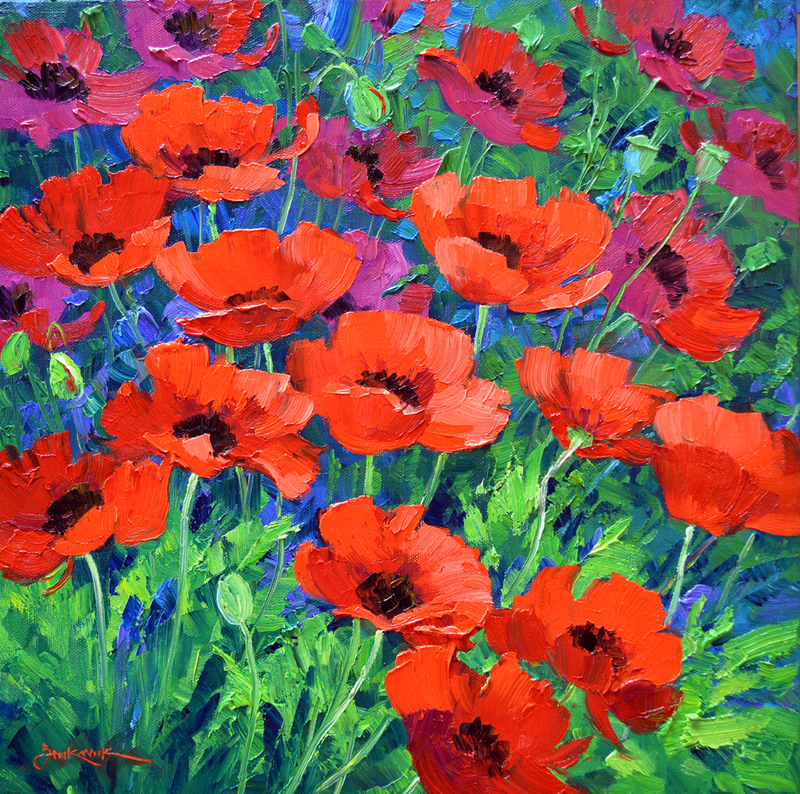 Cadmium Red highlights on the petals, stems, buds and dark centers finish out the Red Corn Poppies bobbing in the gentle breeze. We’re finished. 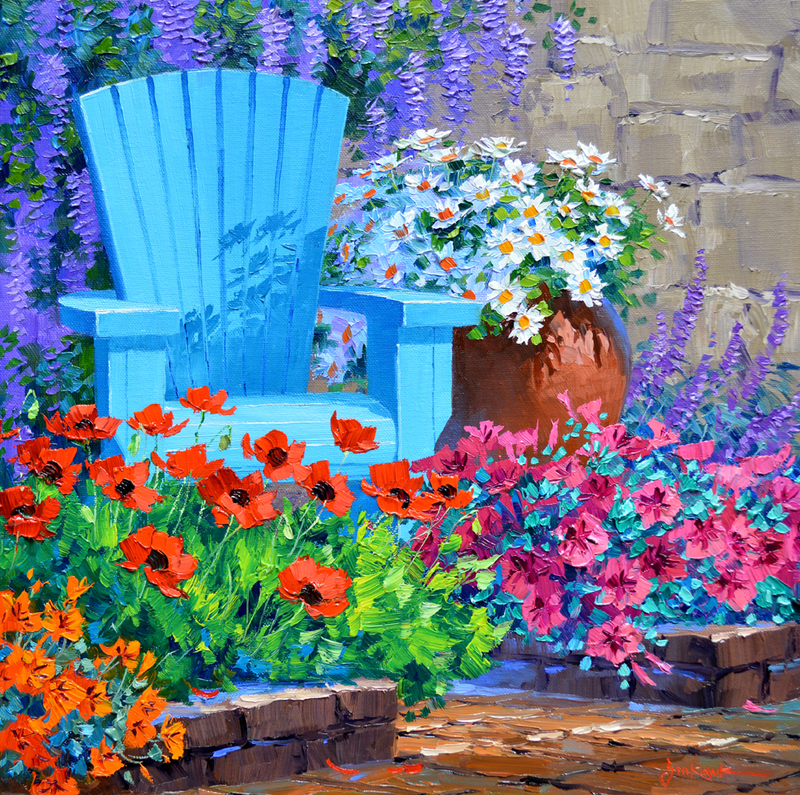 I don’t know about you but I’m ready to take a seat and enjoy a few moments in the colorful garden! Our collectors saw Immersed in Spring, shown above, at our annual Collector Event in Santa Fe. Ray and Jan loved the painting, their faces fell in disappointment when they discovered the red dot on the wall beside it. “No Problem,” I said. “We’ll just do a collaboration”. Ray asked if I could do something to give their painting a little different twist. 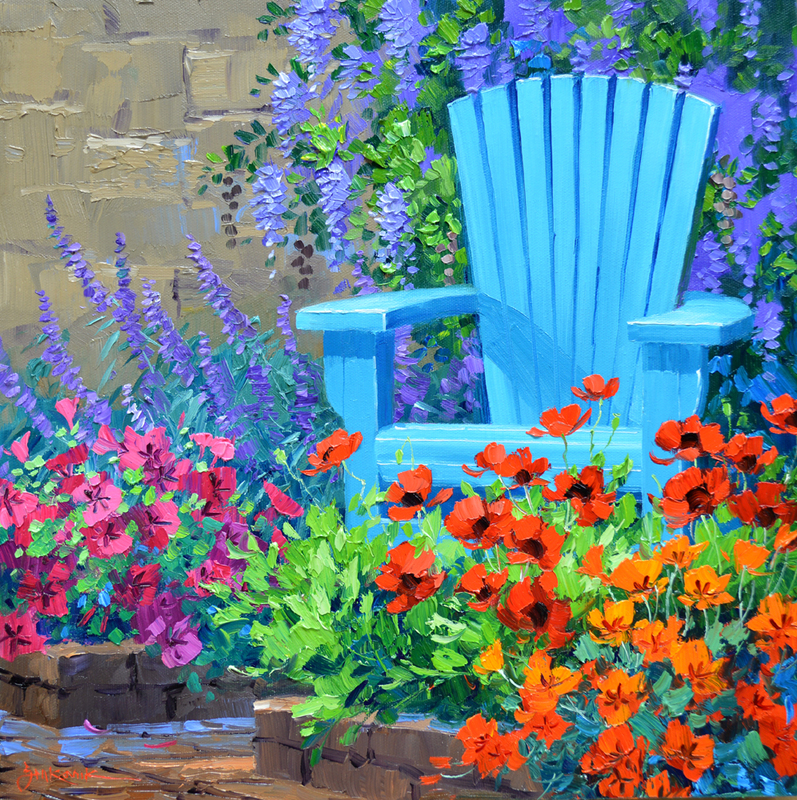 So I decided to flip the composition and add a container of flowers next to the Adirondack Chair. 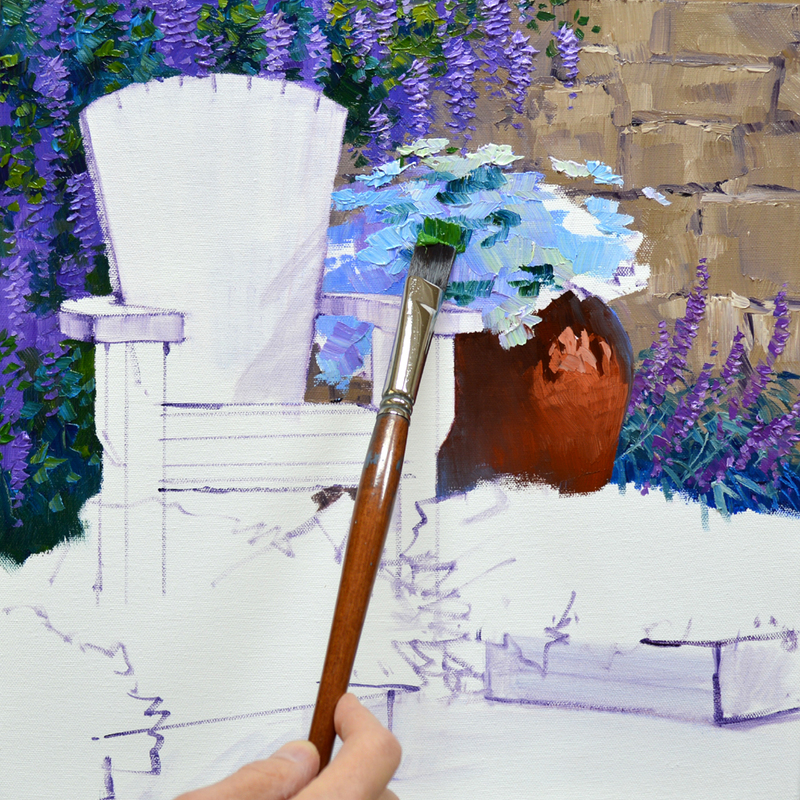 The stone wall and the foliage of the Salvia at its base are painted first. 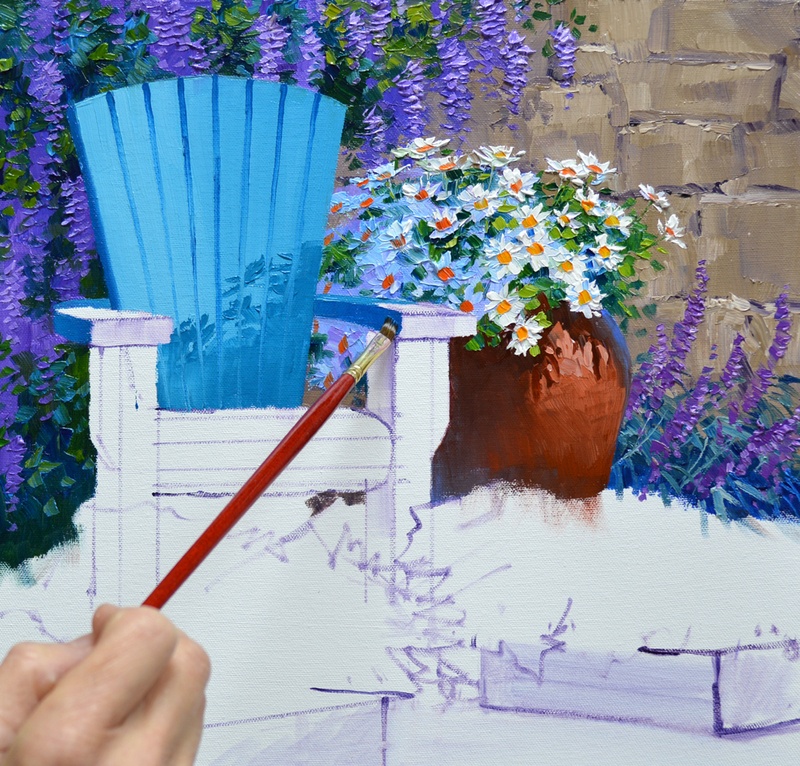 Then I begin blocking in the Wisteria like flowers of the Texas Mountain Laurel growing in back of the chair. 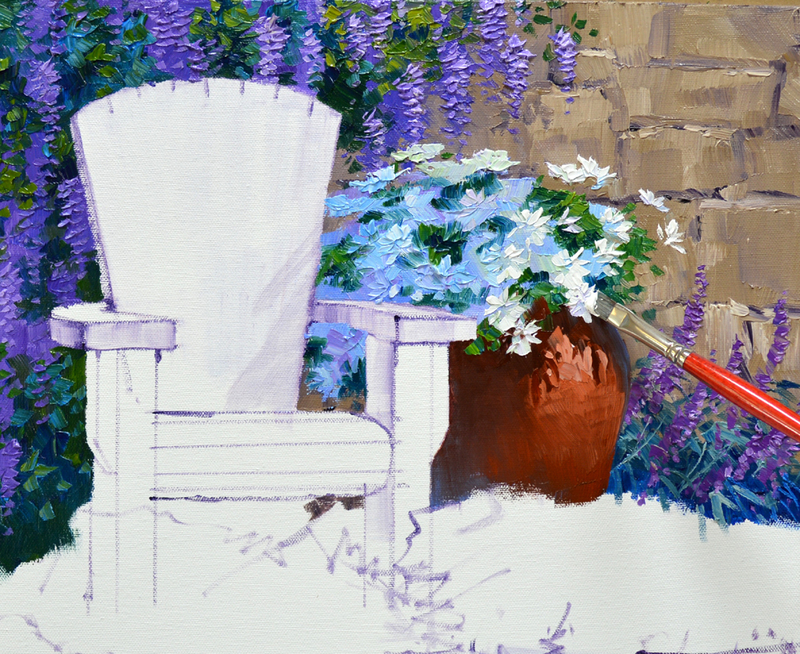 The Mountain Laurel and Salvia are completed, then the White Daisies are painted in my usual sequence of Flowers First, Leaves Last. 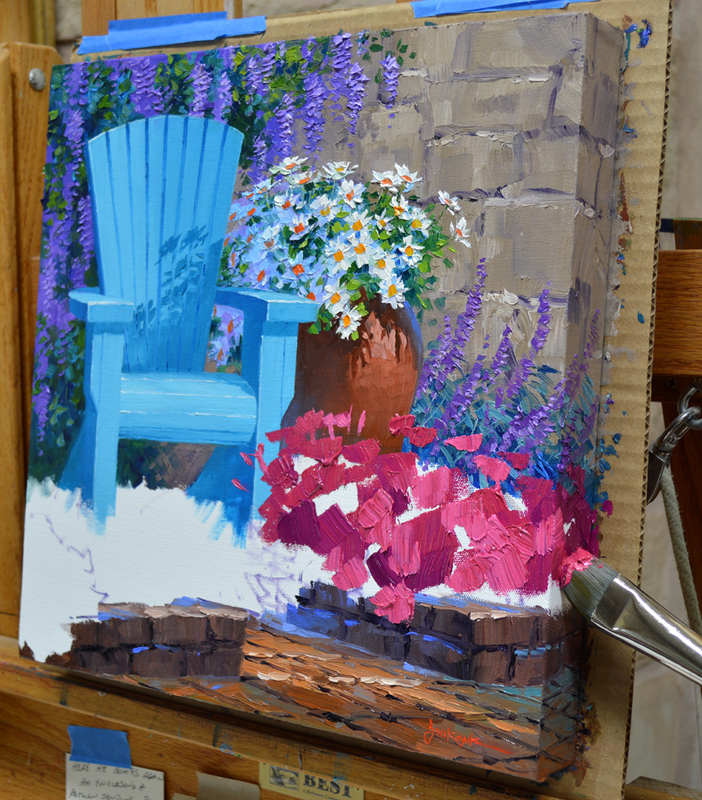 The flowers are blocked in with several shades of blue, purple and aqua. This mass provides the shadows for the white blooms. 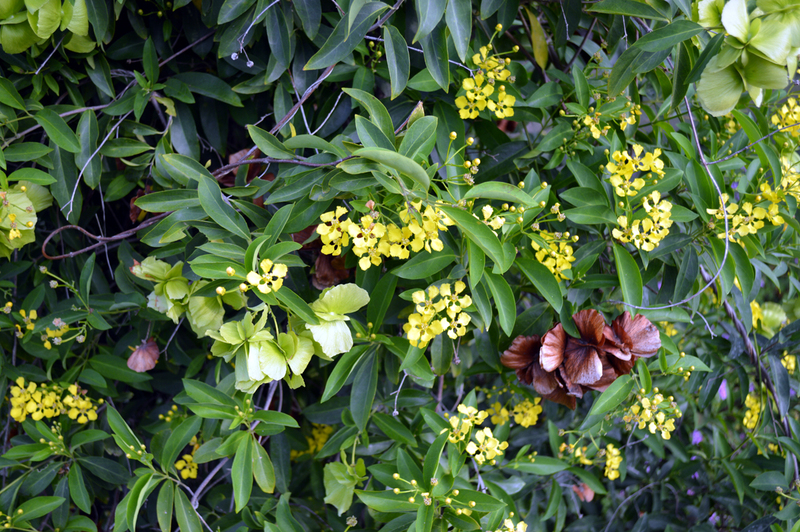 Then the green foliage is worked around the white, giving shape to the flowers. Pure White highlights are added on the petals catching the sunshine. Then yellow centers finish out the Daisies. 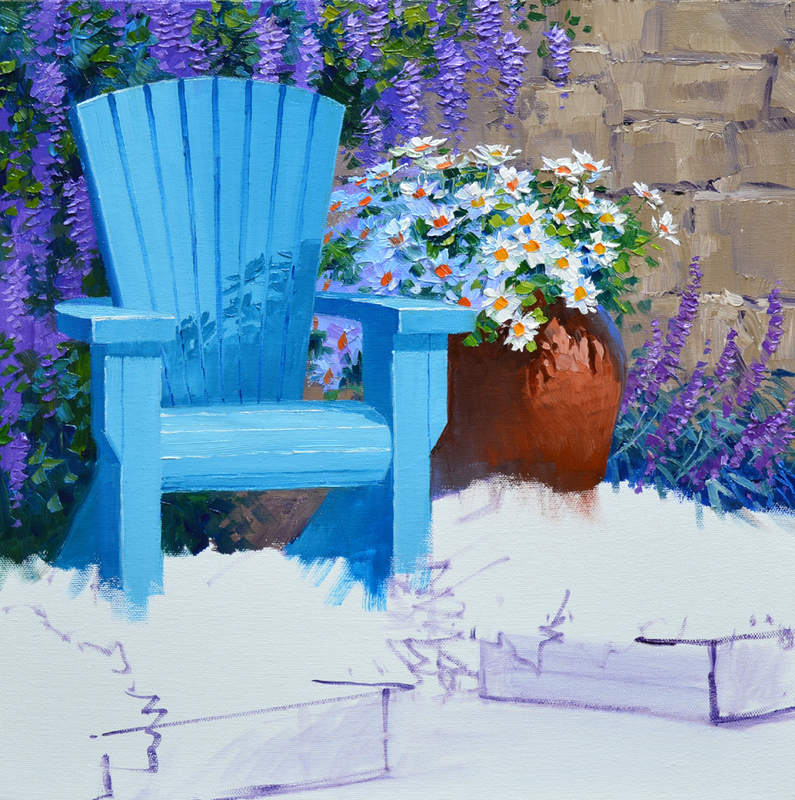 The Adirondack Chair is painted with various mixtures of Pthalo Blue + White. It’s fun casting the shadow of the Daisies across its slatted back. WHEW, that gets the chair! We’re done for today. Hope you’ll come back tomorrow. Make sure to bring your gardening gloves, we’ll be doing some planting! 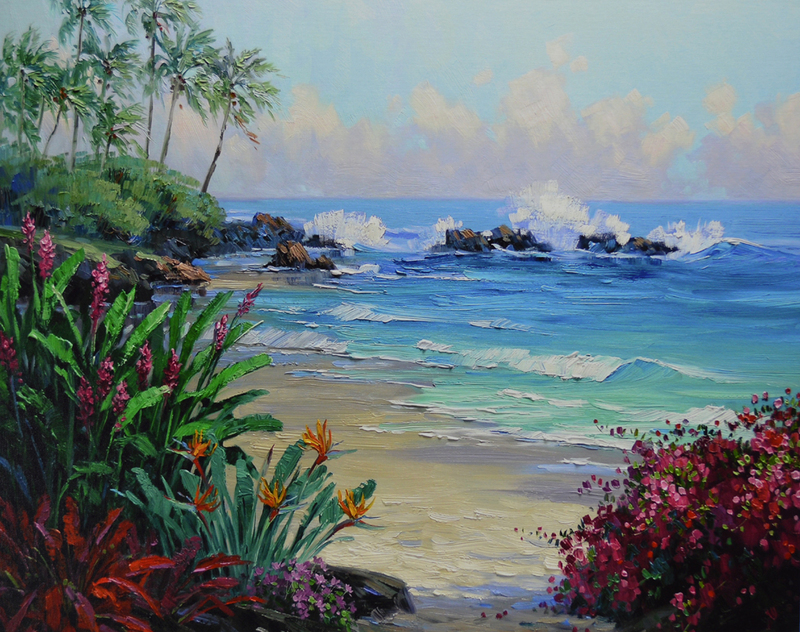 AND…..Jack’s newest article has just come out at Fine Art Studio Online. To read Cul-de-sac Career CLICK HERE.